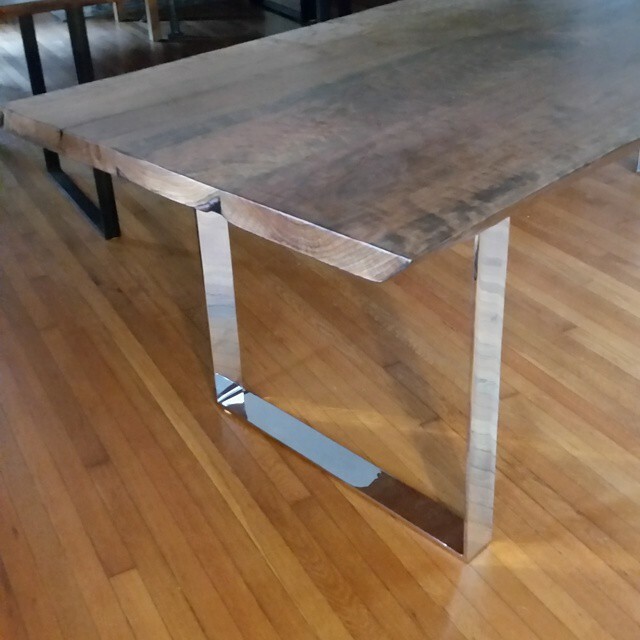 Book matched walnut with steel "X" base. 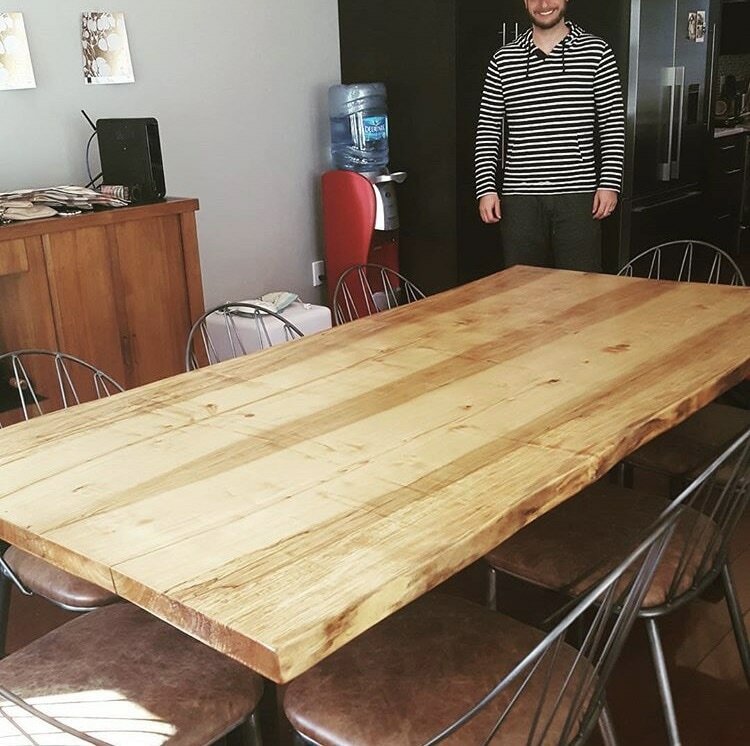 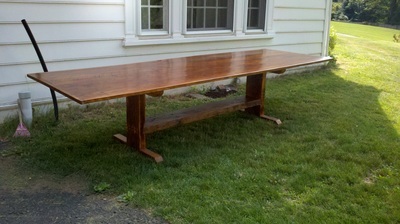 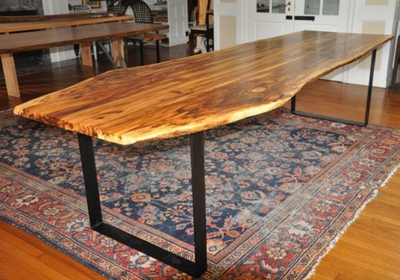 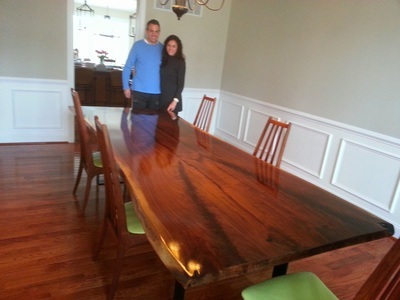 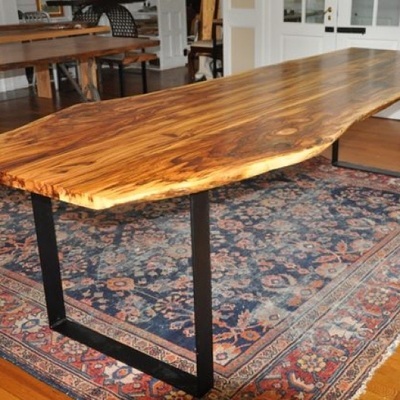 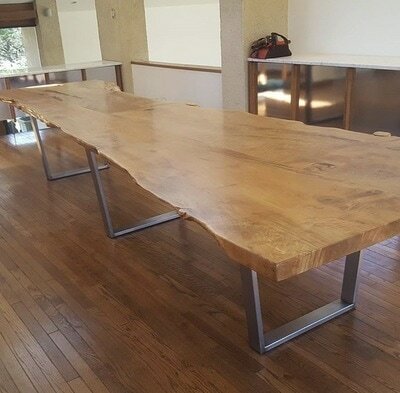 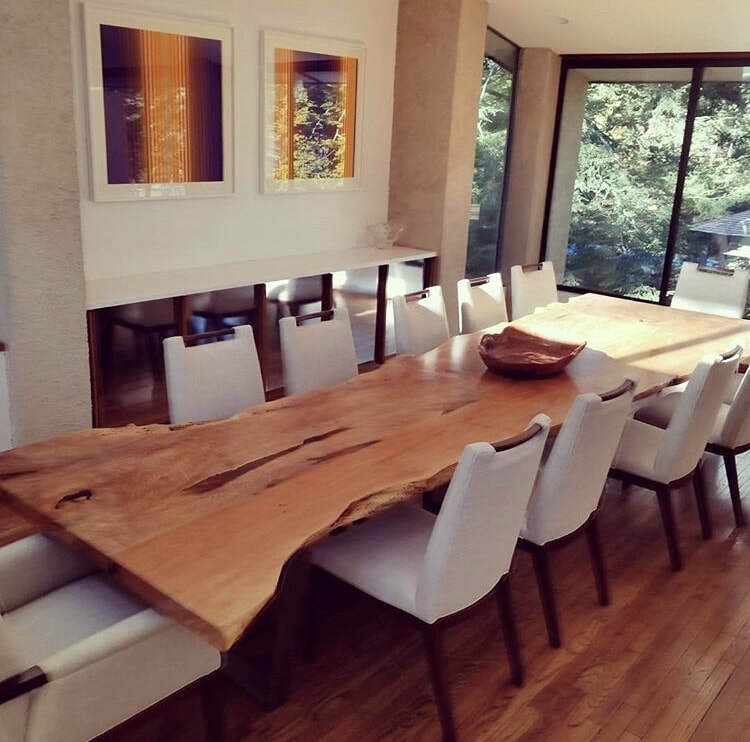 Live edge sycamore dining table. 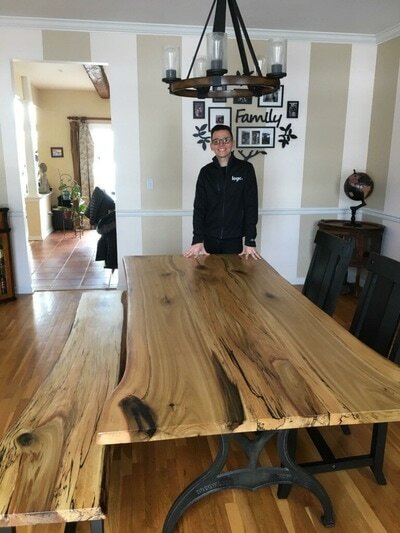 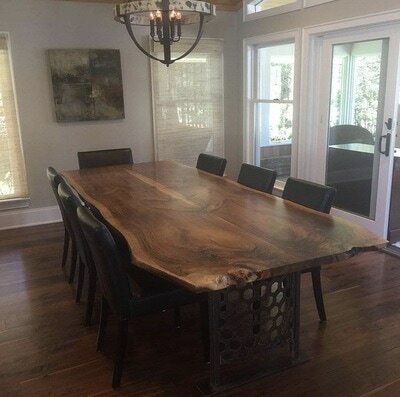 Live edge, book matched walnut dining table. 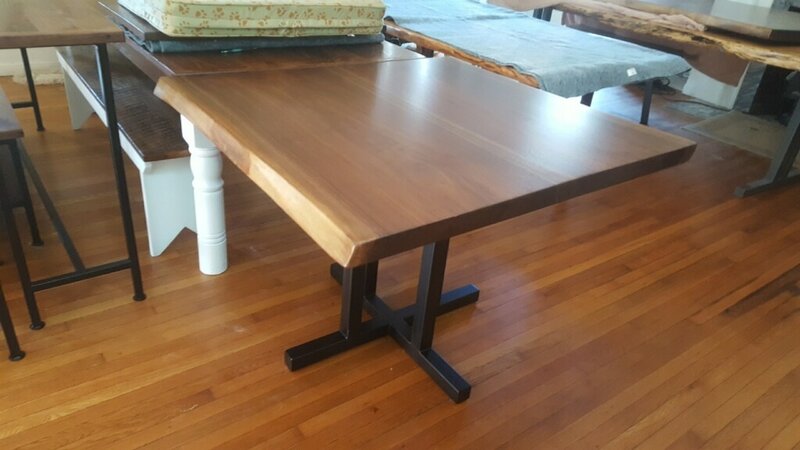 Live edge cherry table with Brooklyn base. 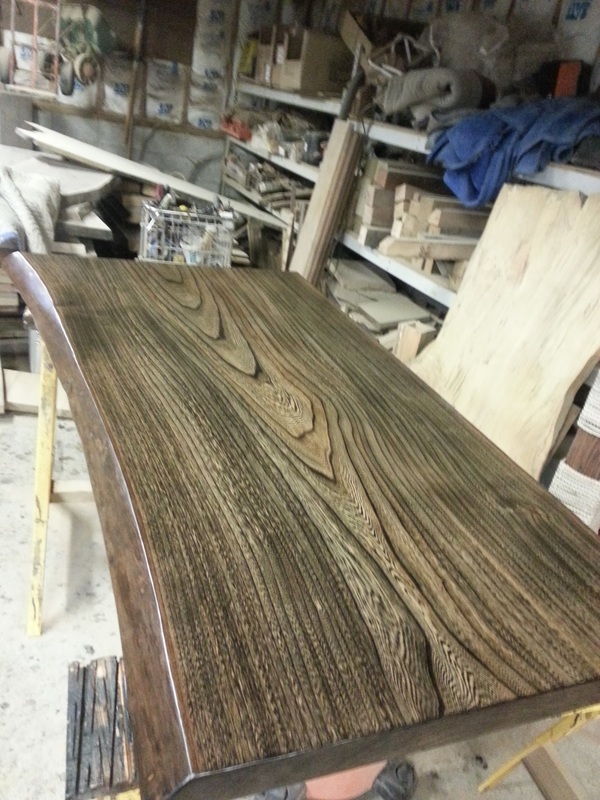 Live edge, book matched butternut. 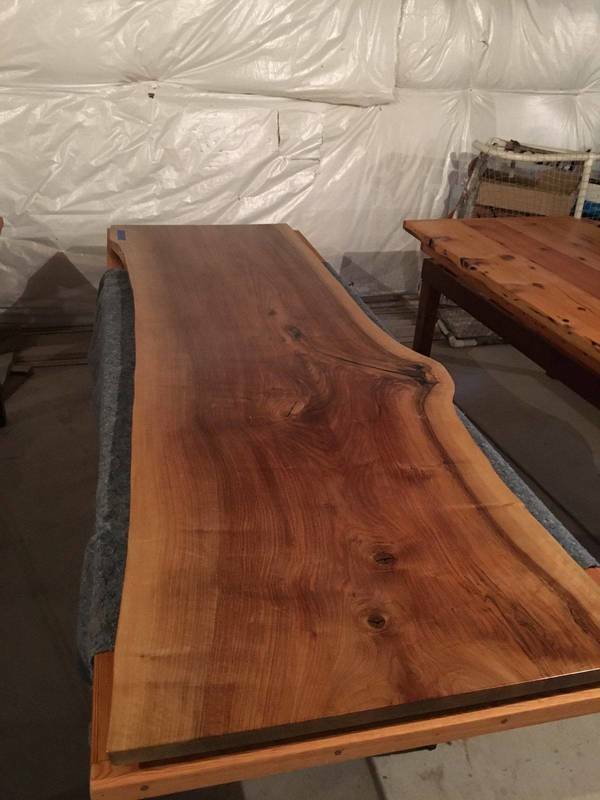 Single slab, live edge butternut. Live edge book matched maple with ambrosia. Spalted beech live edge table. 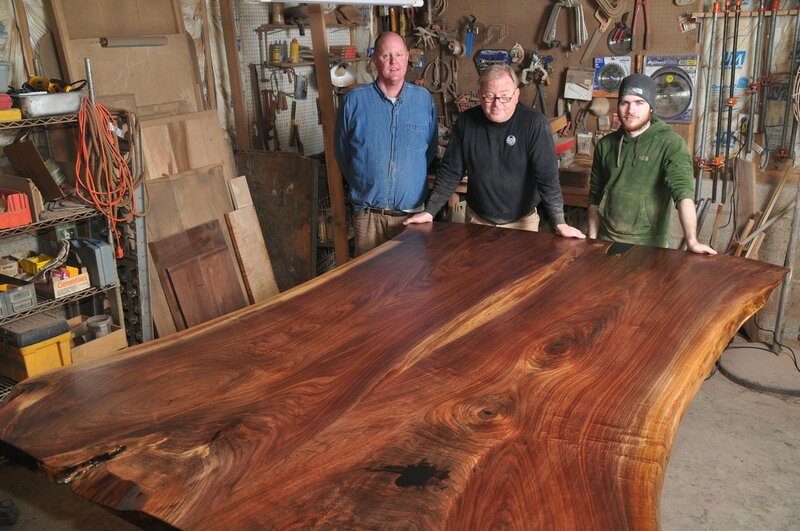 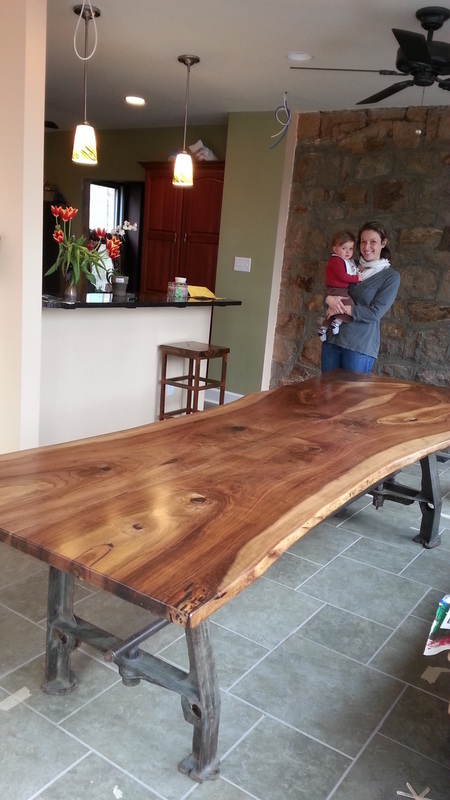 Over 16' long and 3.5' wide, live edge walnut slab, one solid piece! 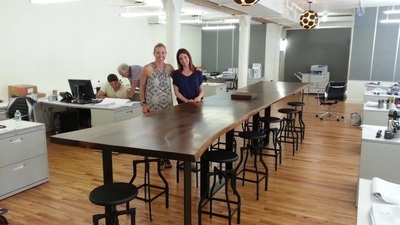 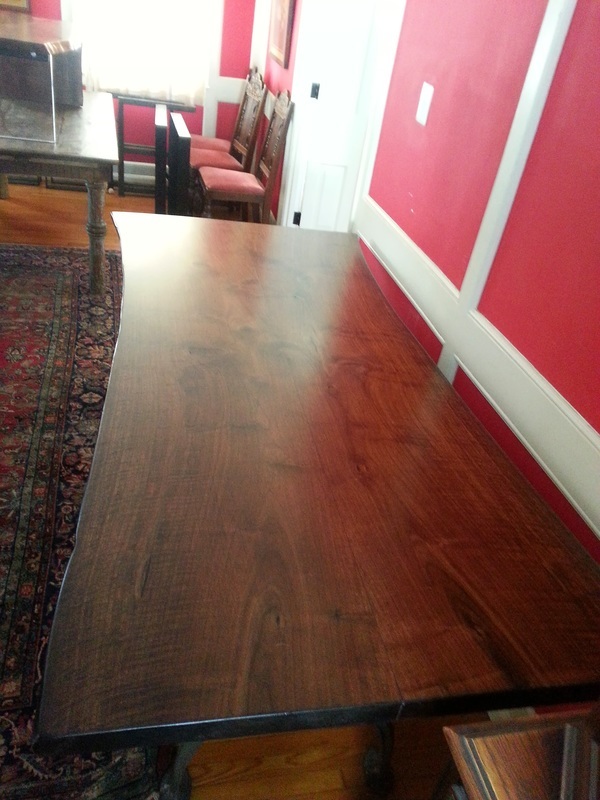 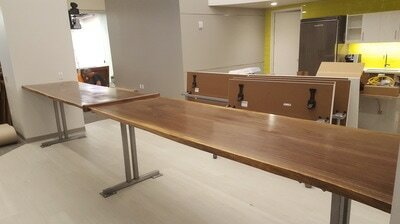 Walnut table for hospitality floor at1735 Market St.
Live edge butternut with Brooklyn base. 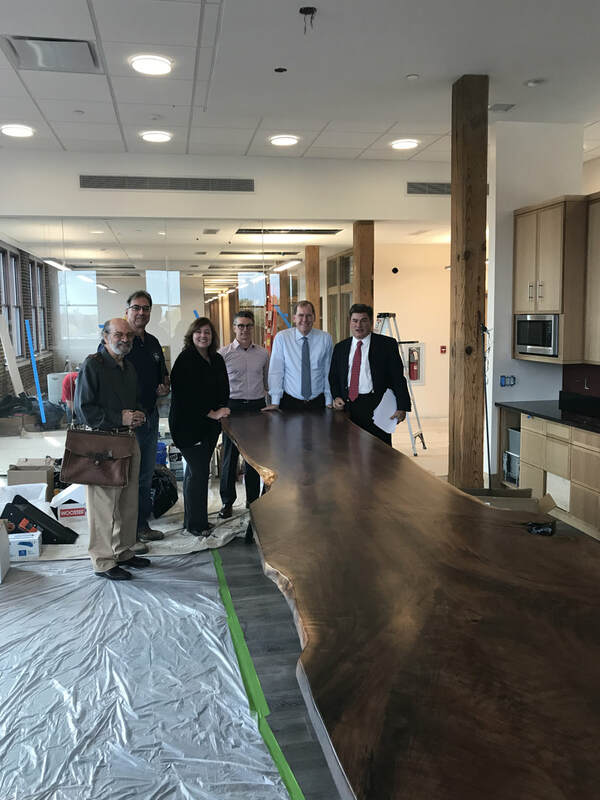 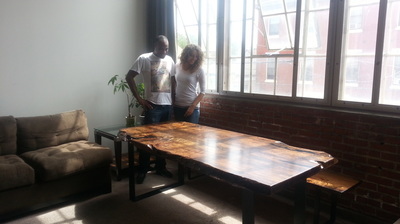 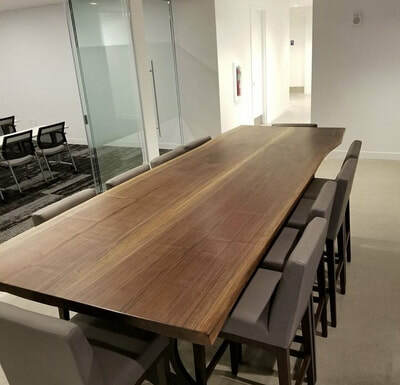 Walnut table for hospitality floor at 1735 Market Street. 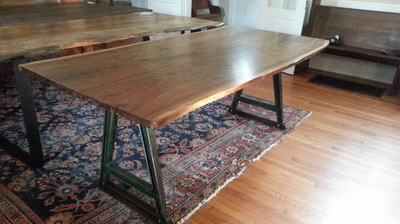 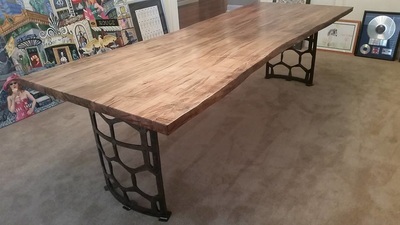 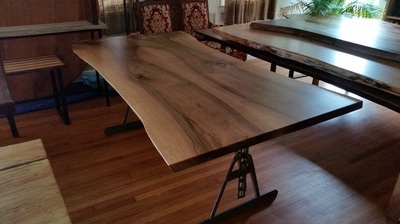 Live edge walnut desk with repurposed shaft drive hanger base. 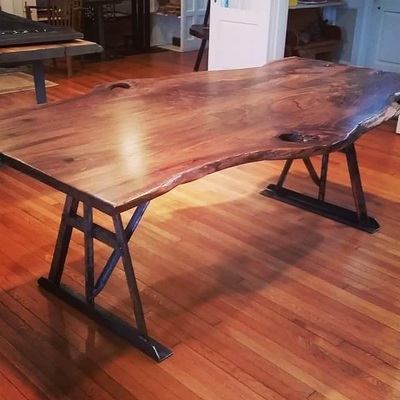 Live edge English walnut with repurposed iron base. 14' live edge maple with brushed steel base. 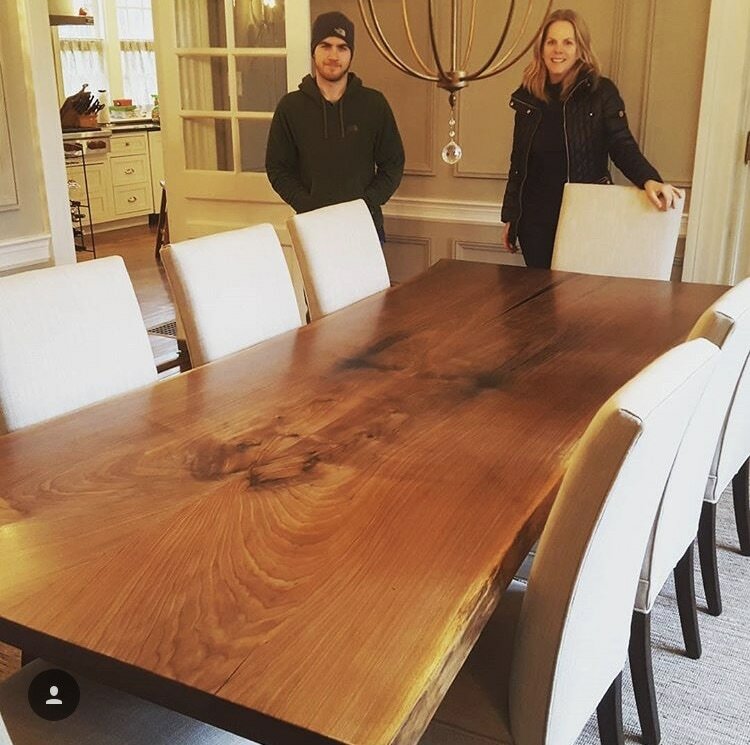 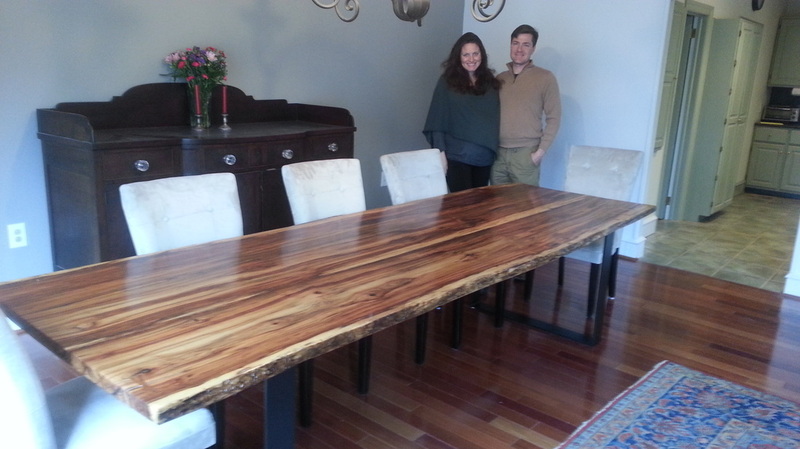 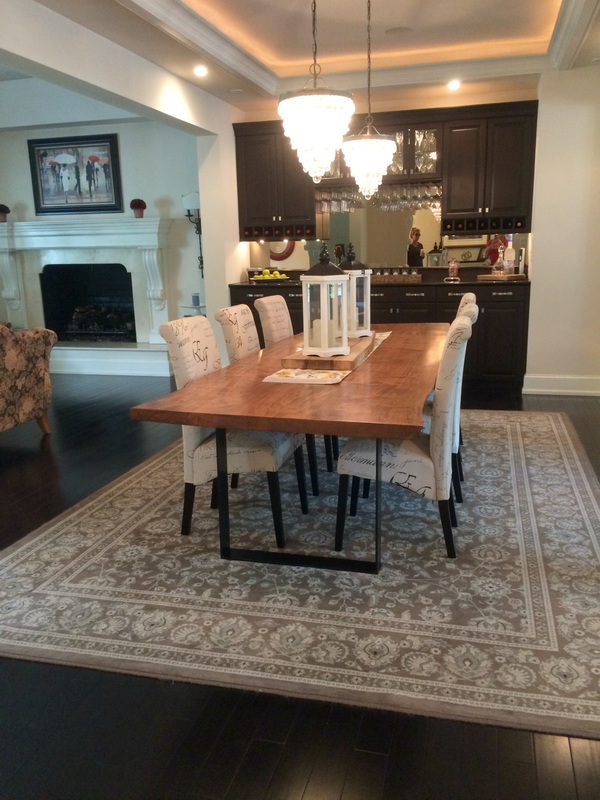 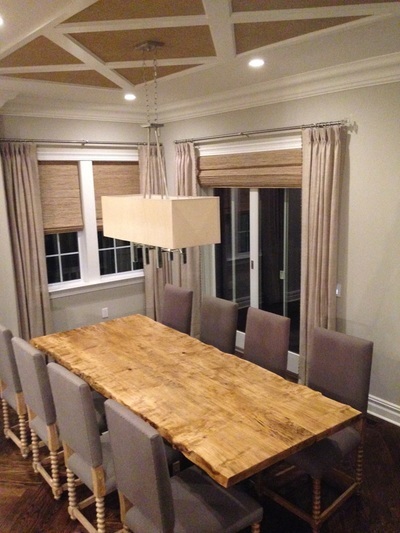 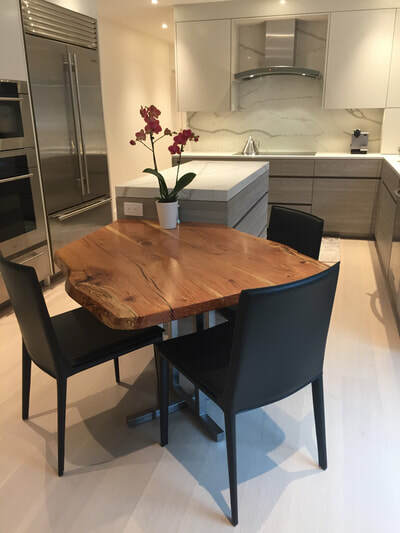 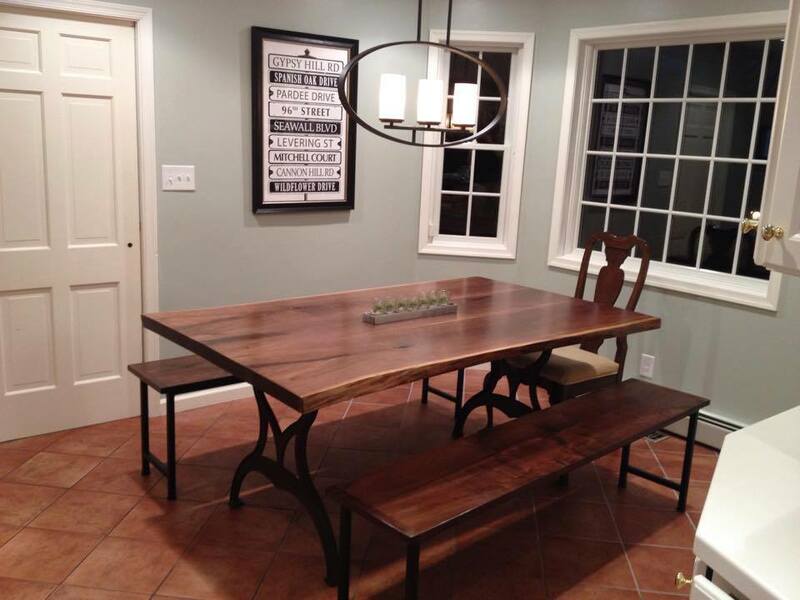 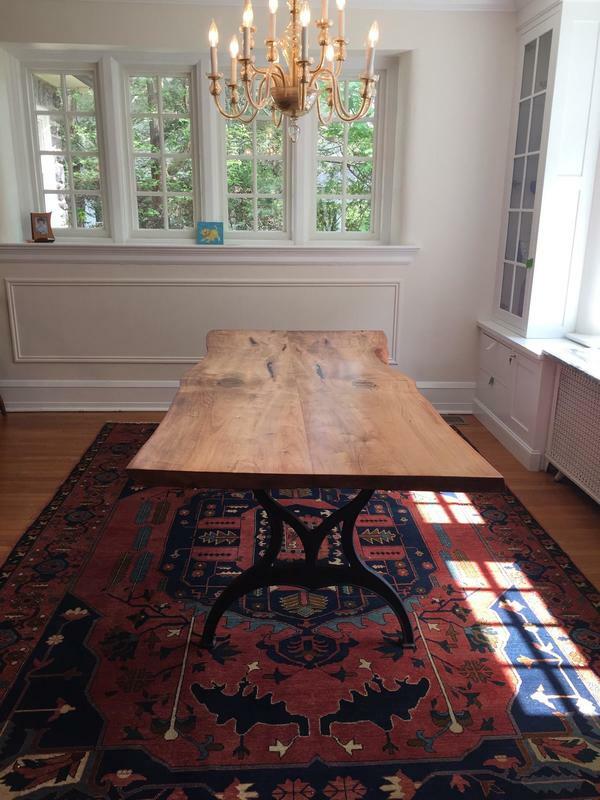 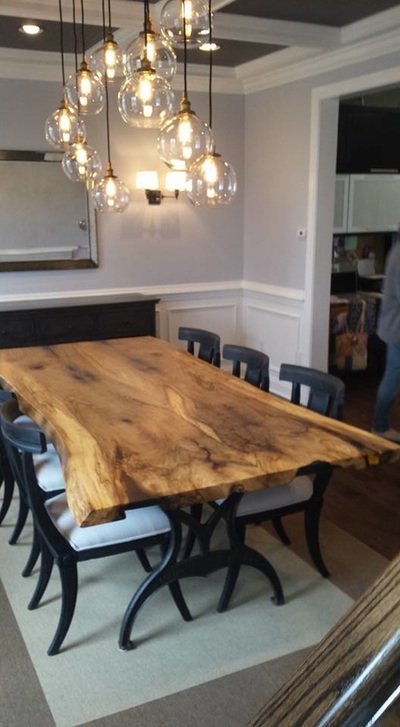 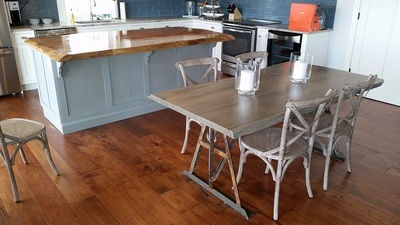 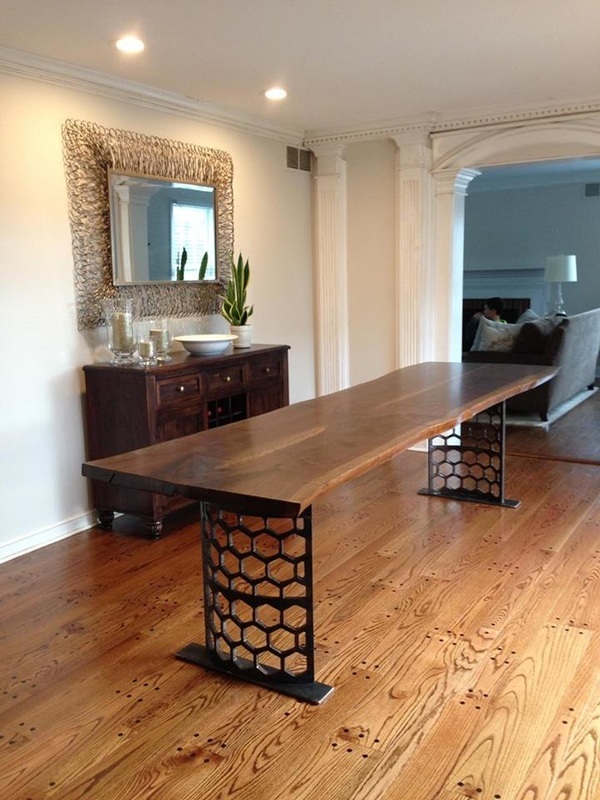 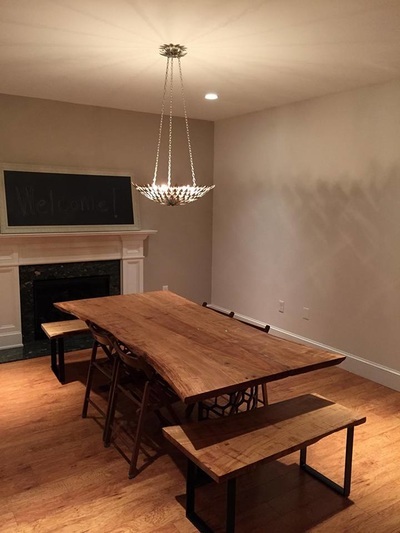 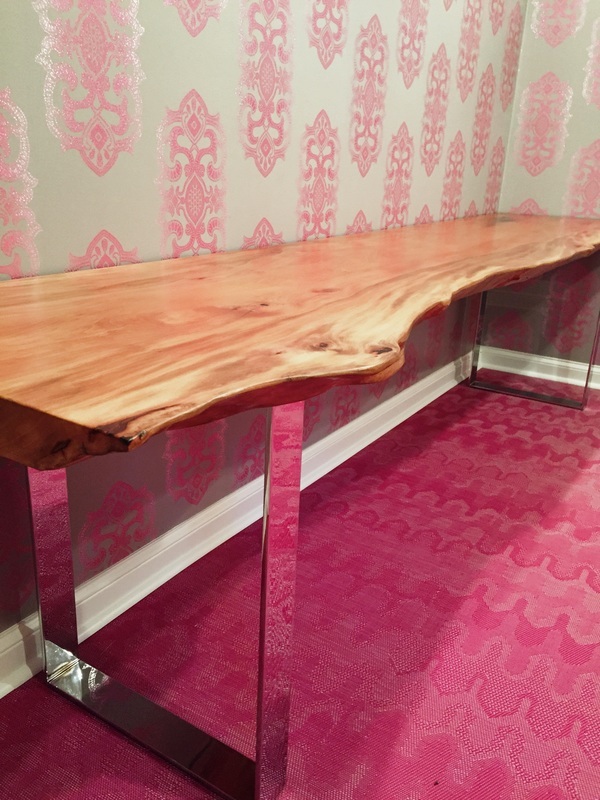 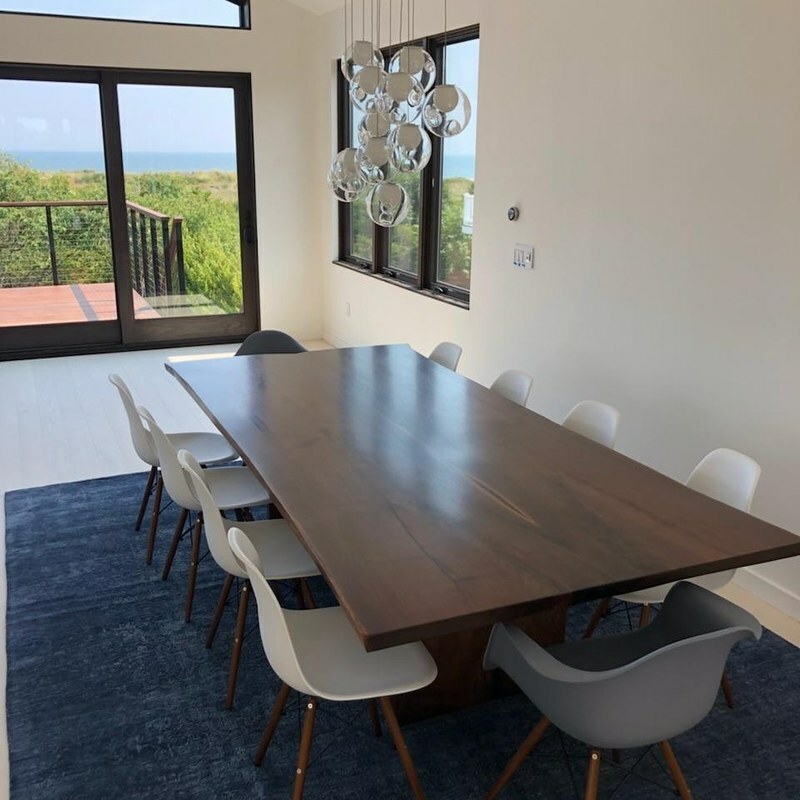 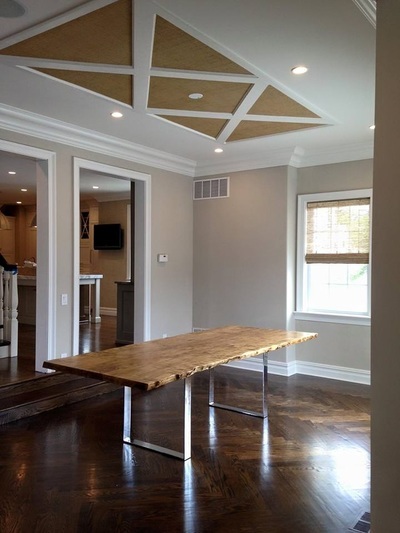 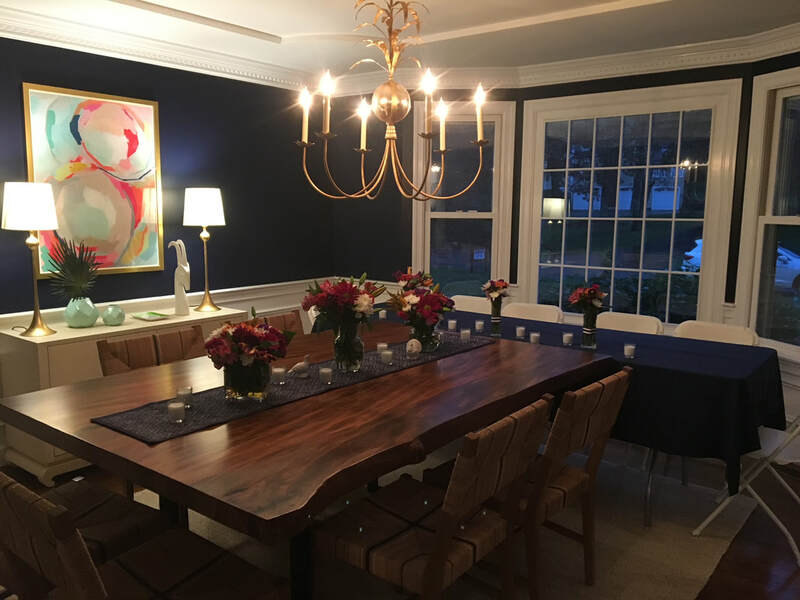 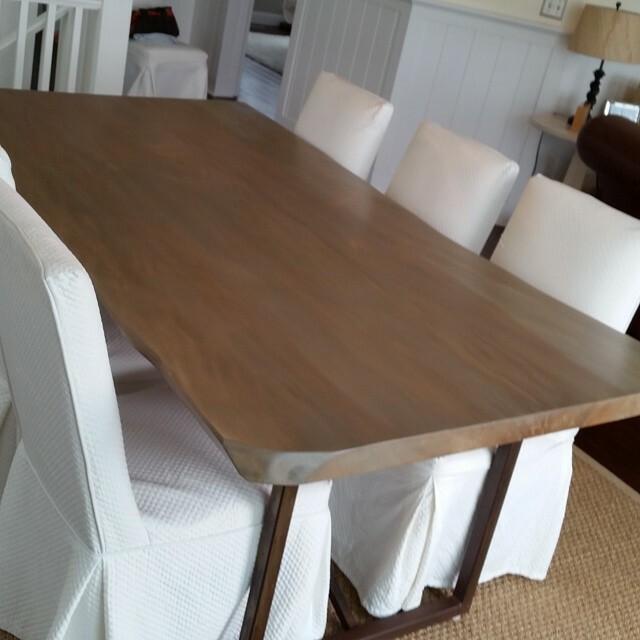 Live edge silver maple dining table, collaboration with Hannah Dee Interiors. 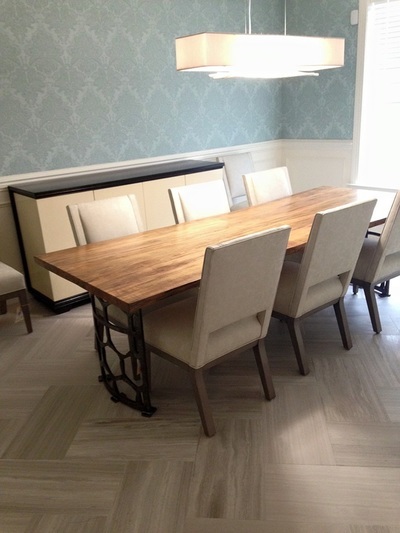 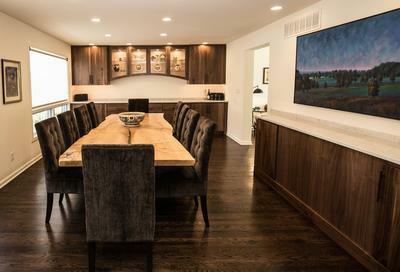 Bookmatched Walnut, collaboration with Ann Kelly Interiors. Live edge walnut dining table. 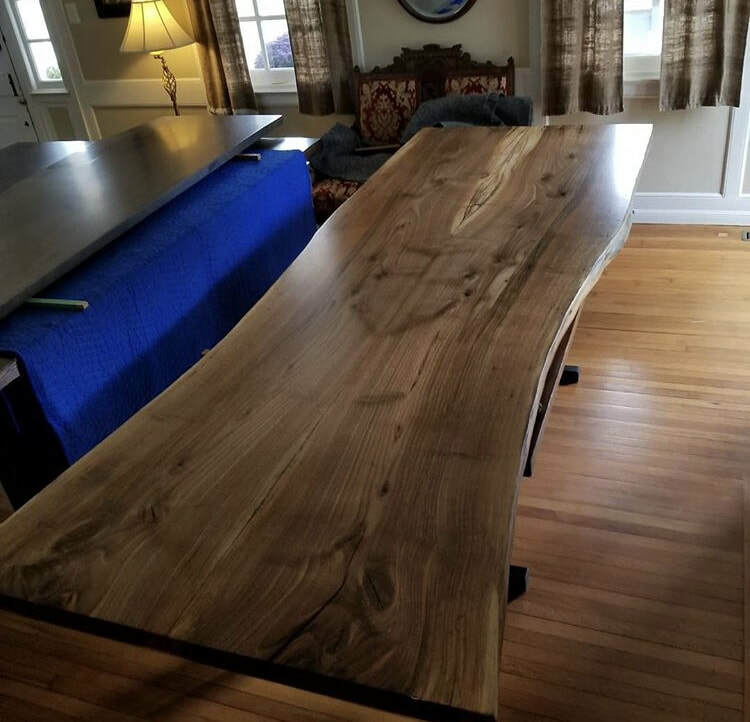 Single slab live edge walnut. 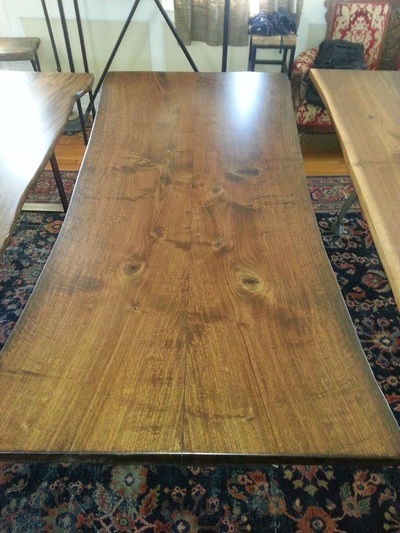 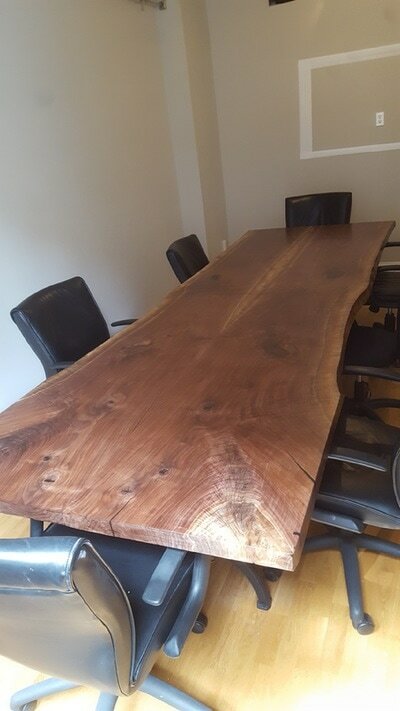 Bookmatched live edge walnut conference table. 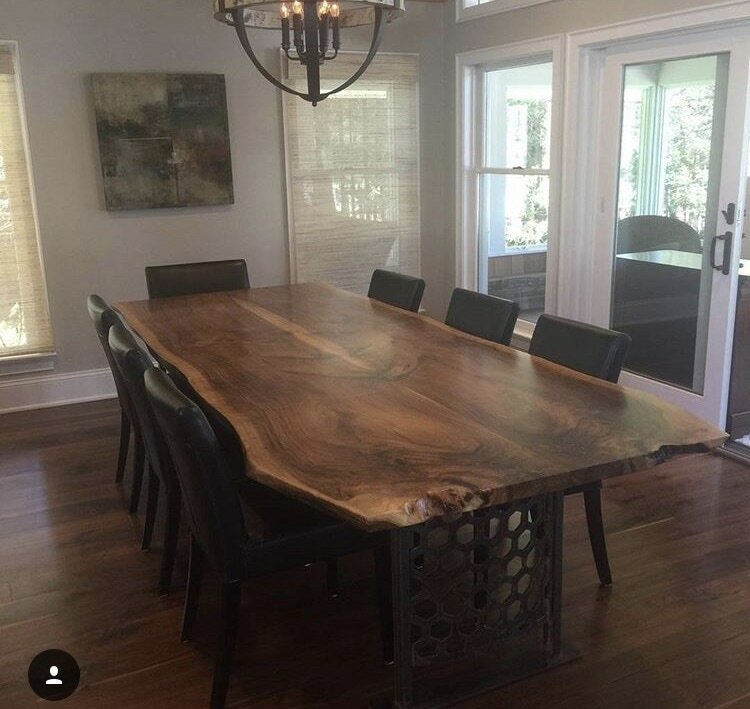 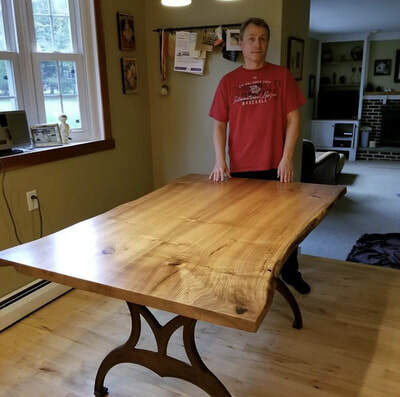 14' live edge silver maple dining table. 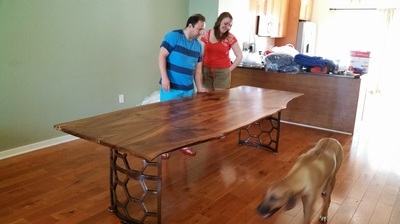 Live edge walnut game table. 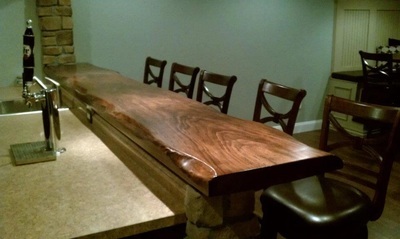 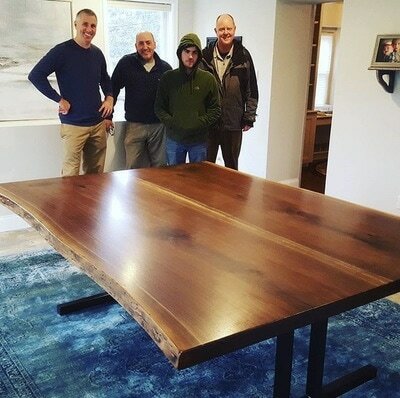 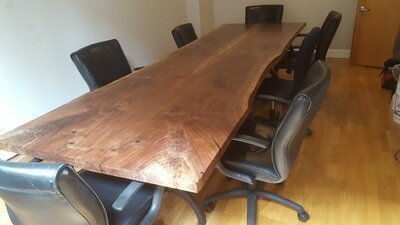 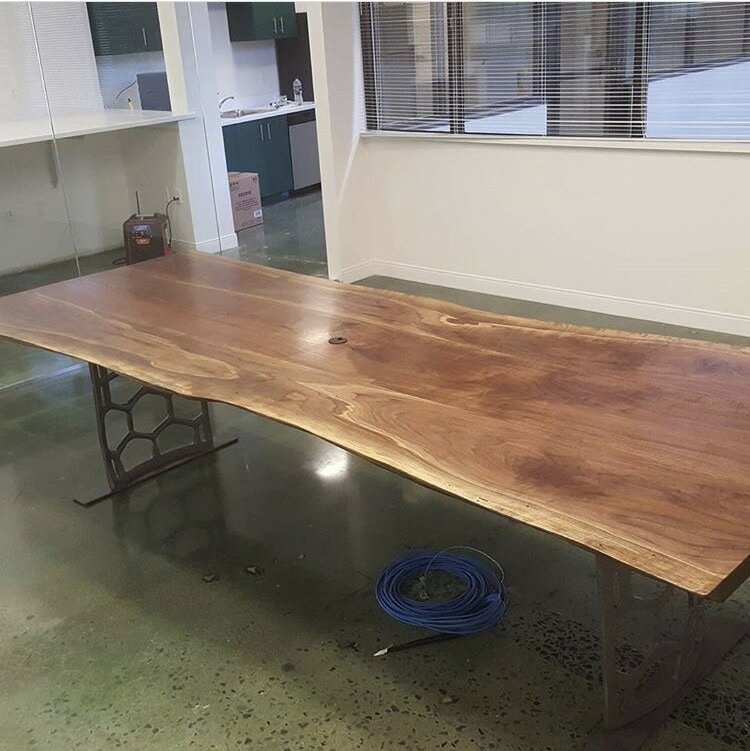 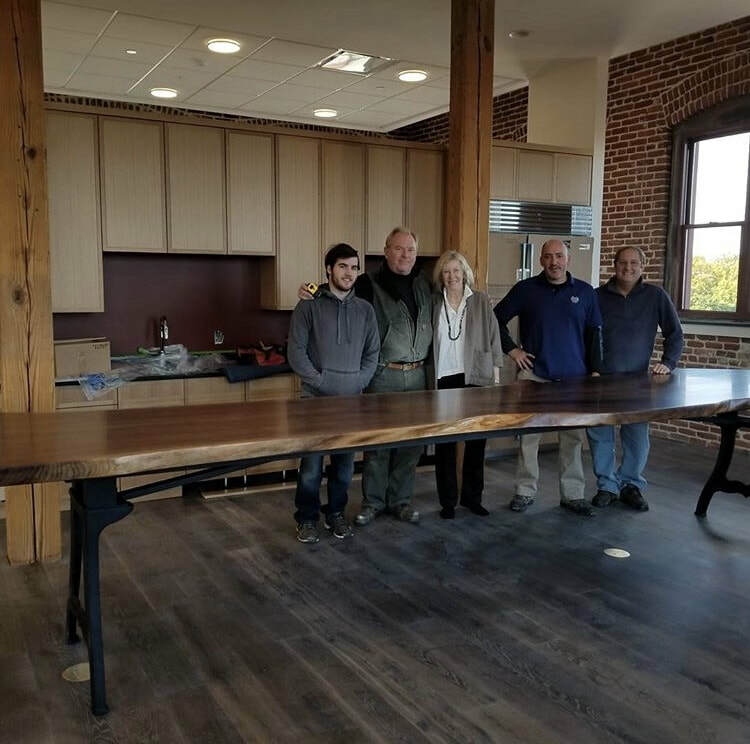 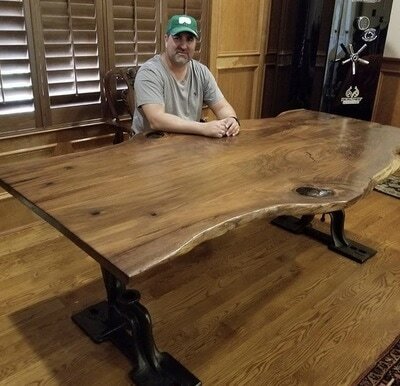 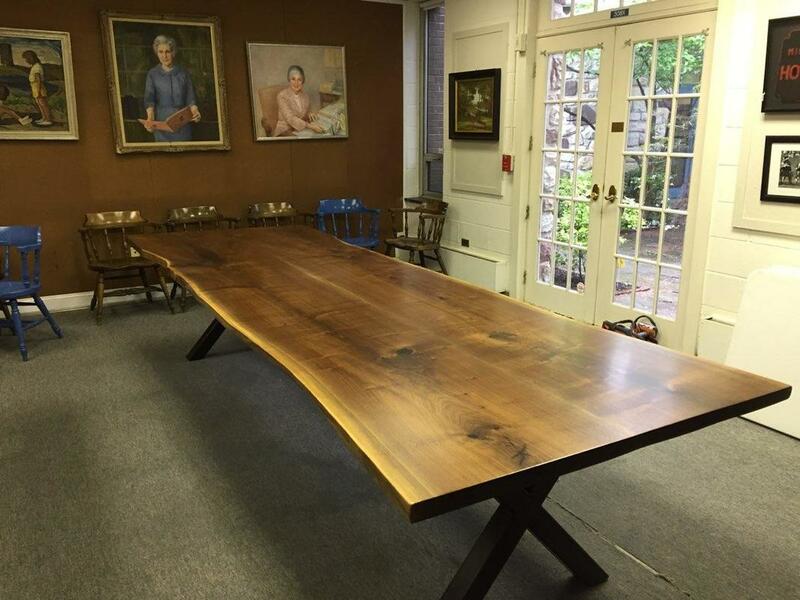 10' live edge walnut conference table. 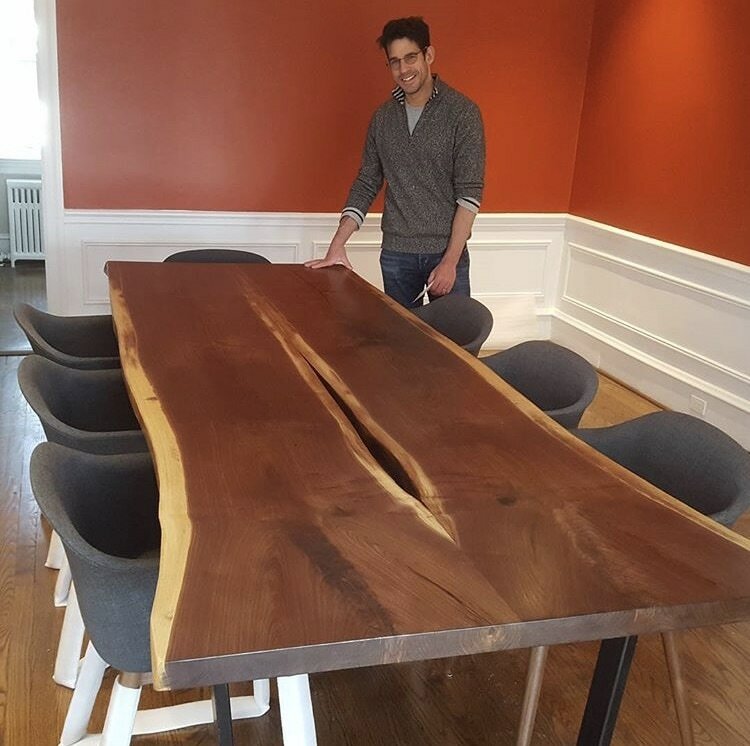 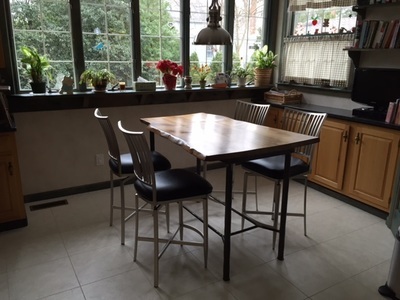 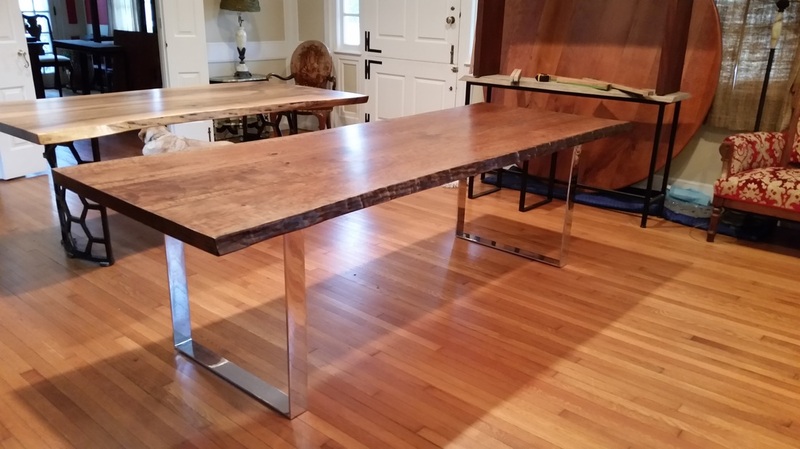 Live edge silver maple dining table with Brooklyn base. 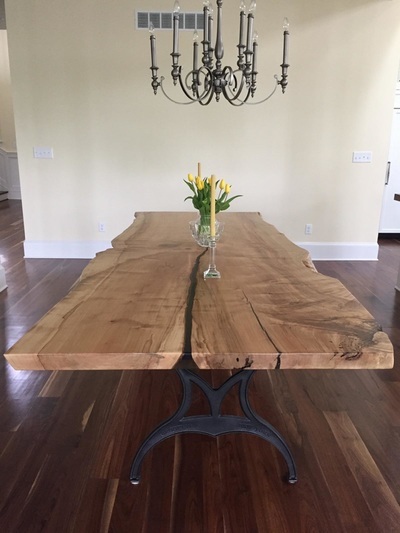 Live edge walnut with "New York" cast iron base. 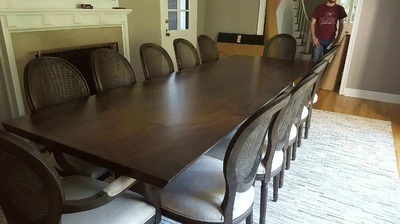 Looks great with barrel chairs! 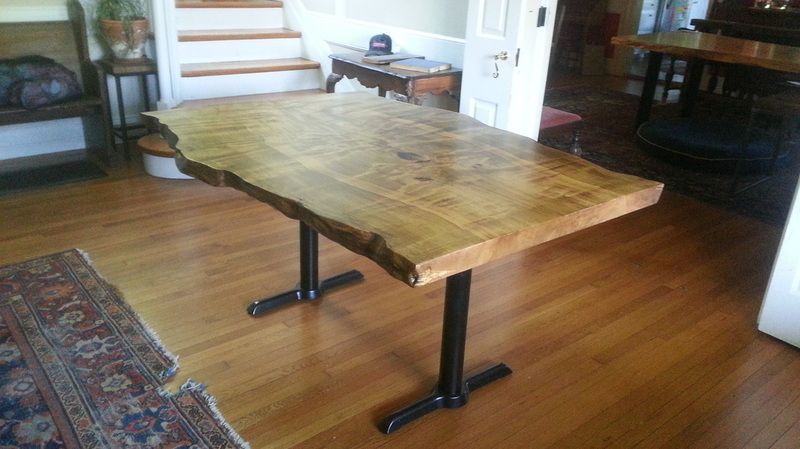 Live edge cedar with cast iron base. Live edge walnut slab with steel band base. 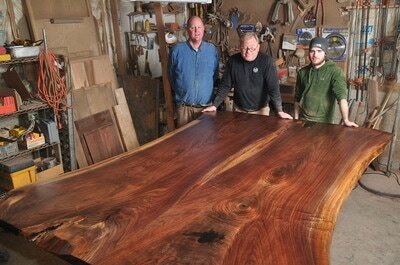 52" wide live edge sycamore slab with stell band base. 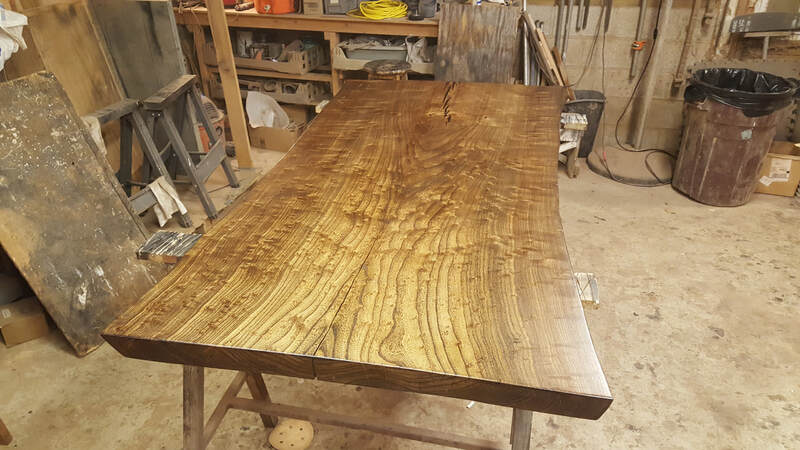 Live edge walnut on iron base from a mulch grinder. 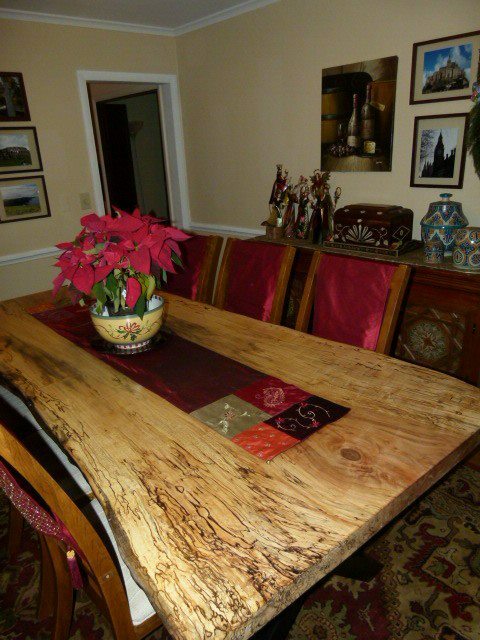 Very rare spalted hickory, live edge table on steel bands. Live edge book matched cherry on cast base. Live edge walnut on repurposed scaffolding base. Live edge walnut on cast base with matching benches. 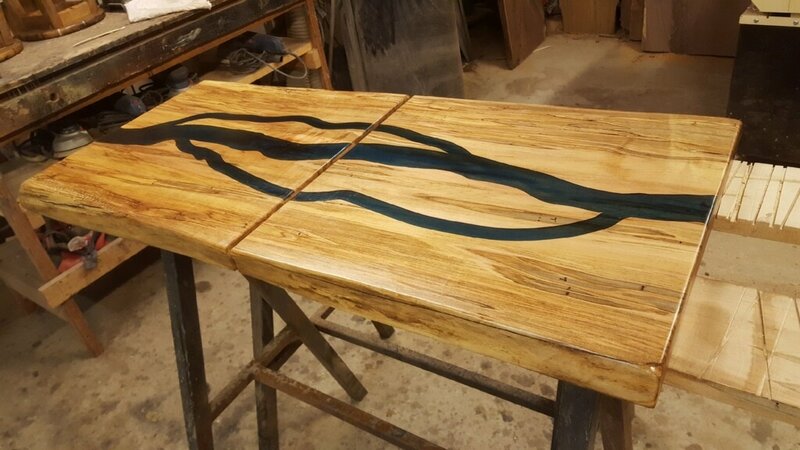 Live edge spalted silver maple with steel band base. 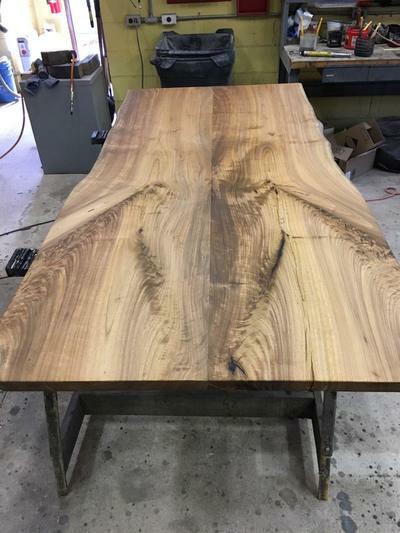 Live edge walnut top, outside pieces are book matched. Live edge walnut slab on industrial cast iron base. 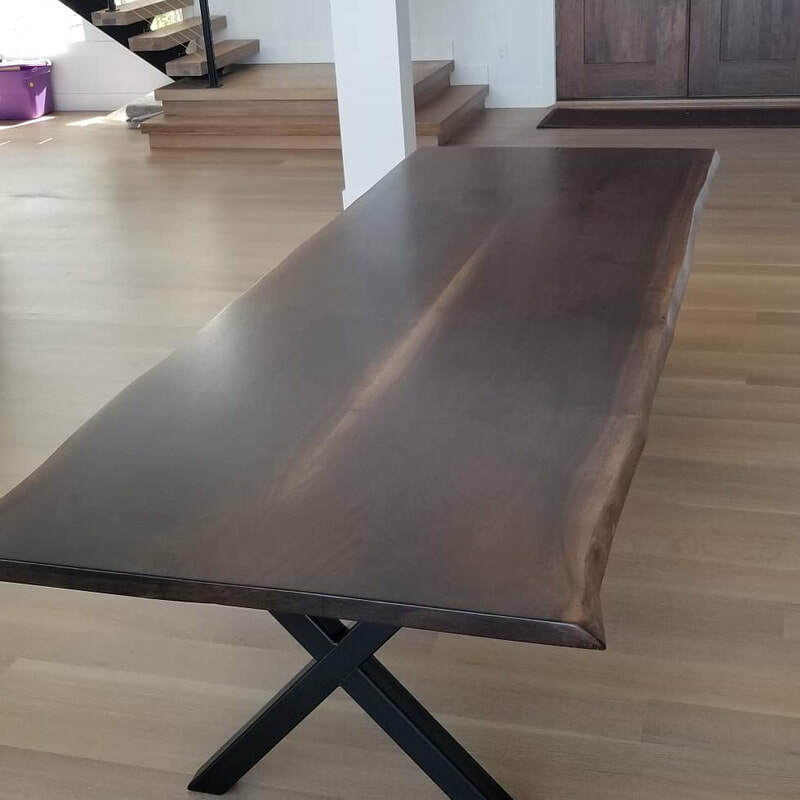 Live edge walnut on steel band base. 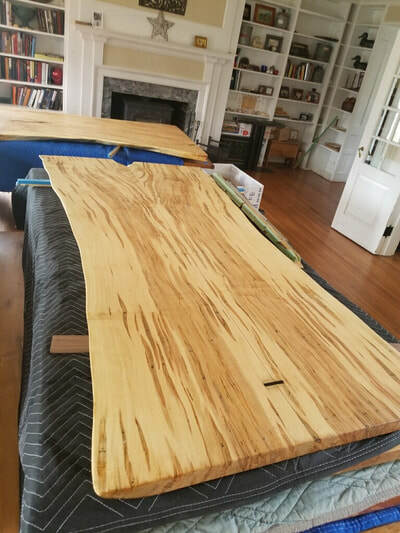 Live edge poplar bar top. 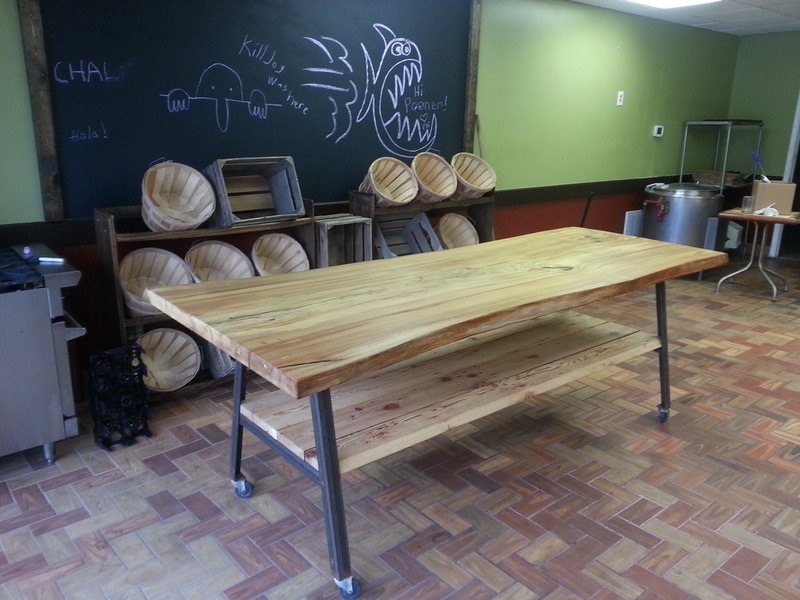 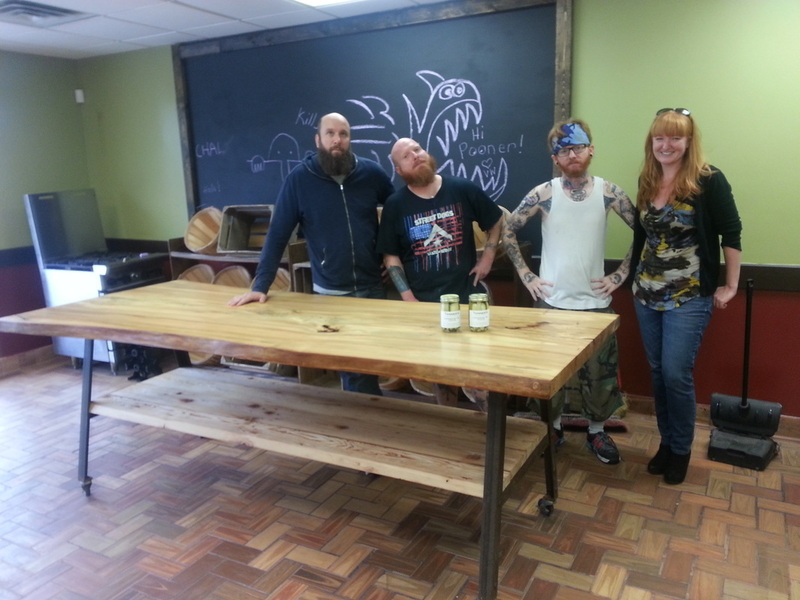 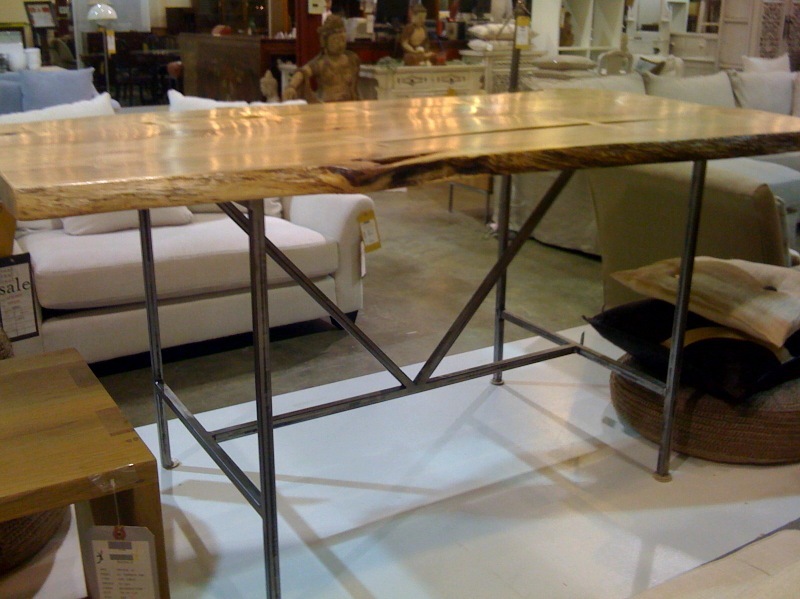 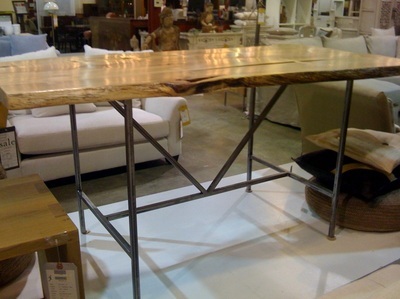 Live edge spalted silver maple table...the first one we ever sold. 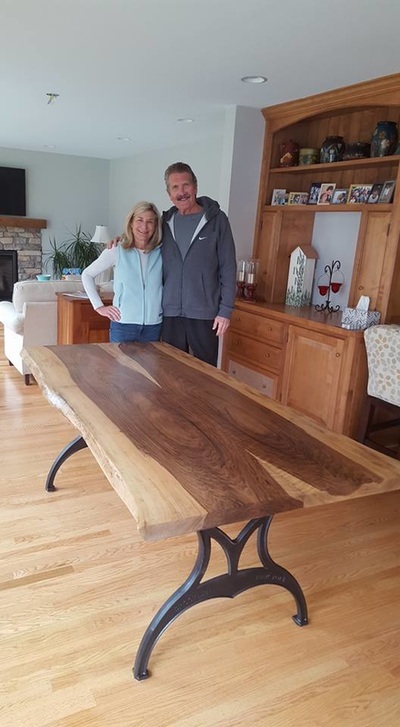 Thanks Christie and Dan! Live edge elm slab top...looks really cool with dark stain. 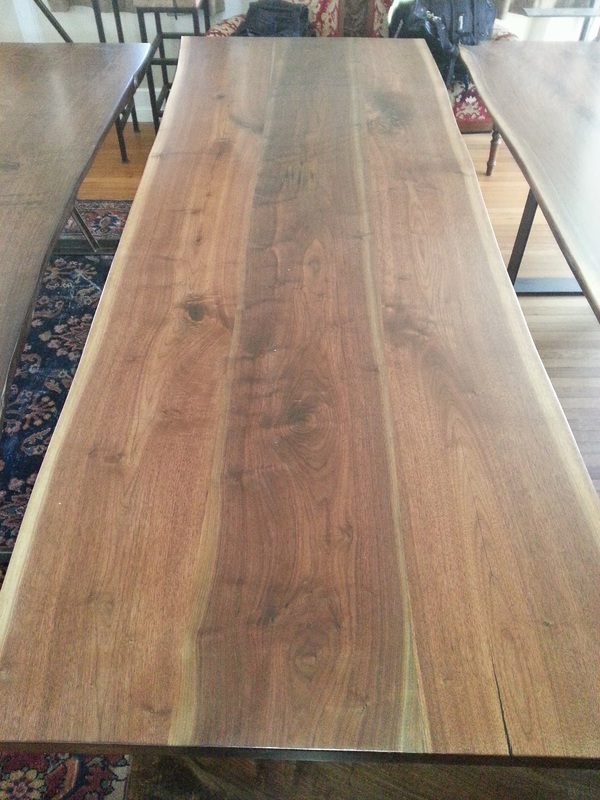 Book matched walnut on reclaimed cast base, used at a banquet. 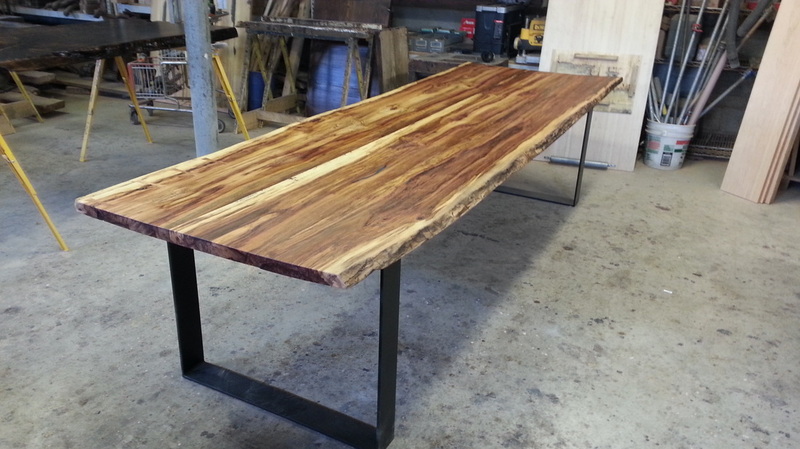 Spalted hickory, live edge table with simple black bands. 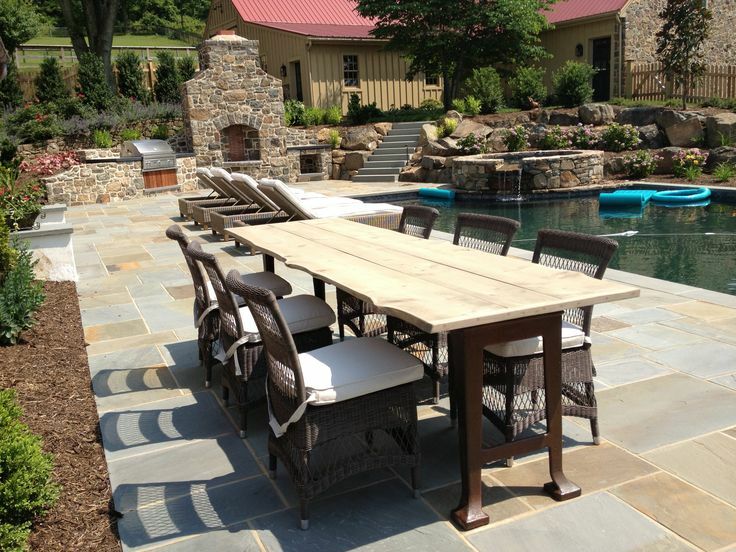 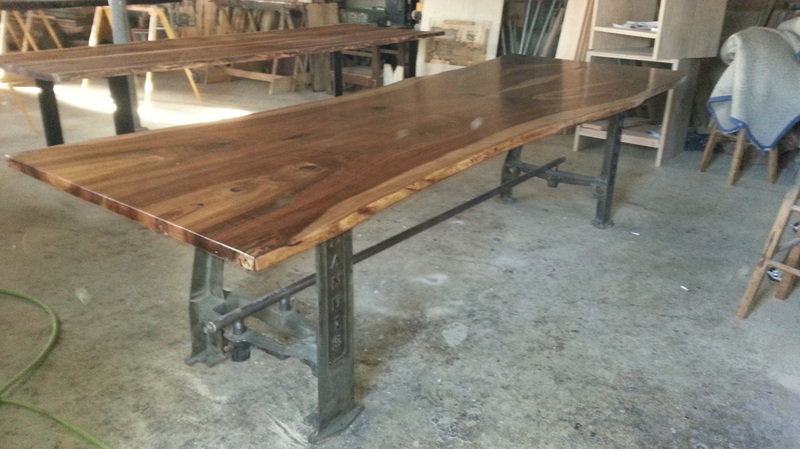 Book matched English walnut with industrial iron base. 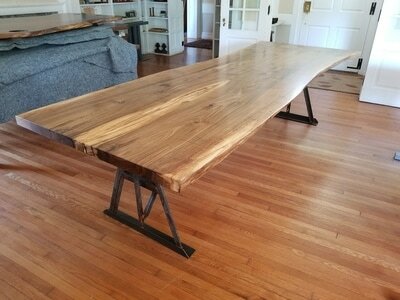 Live edge sycamore with chrome base. Chrome base supporting a live edge top. Live edge sycamore slab with distressed finish and distressed base. 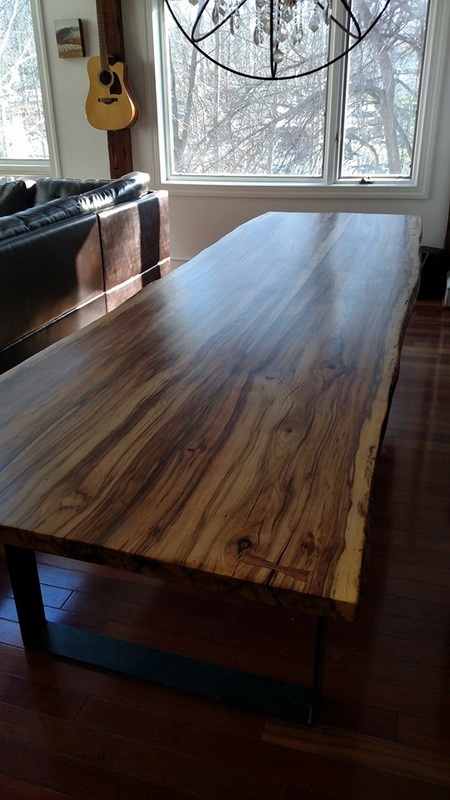 Live edge English walnut with "Brooklyn" cast base. Live edge spalted silver maple, 10' by 4'. 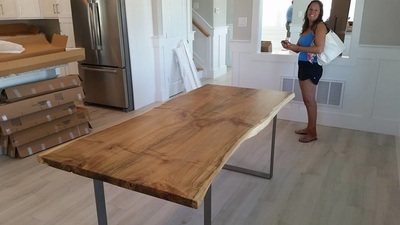 7.5' live edge Beach table with repurposed mulch sifter base. 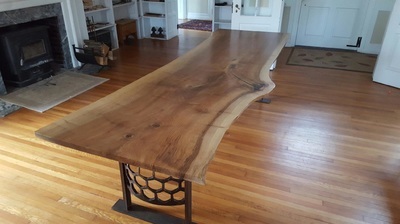 Live edge cherry with iron base. 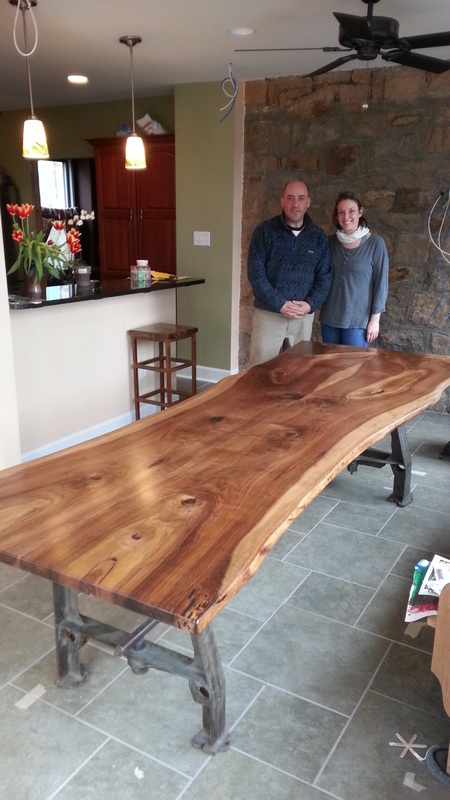 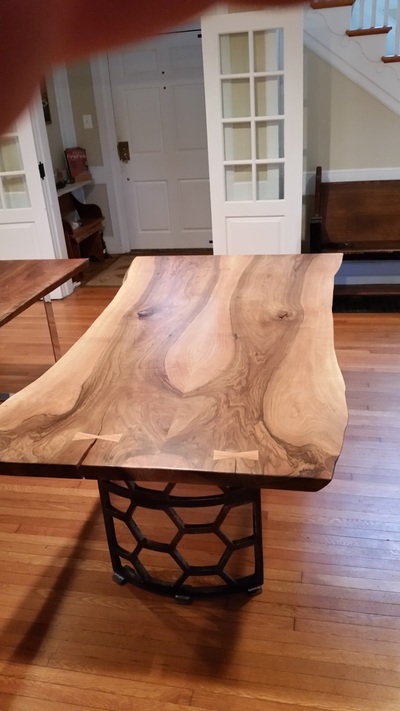 Live edge English Walnut with "Brooklyn" base. .
Live edge maple dining table. 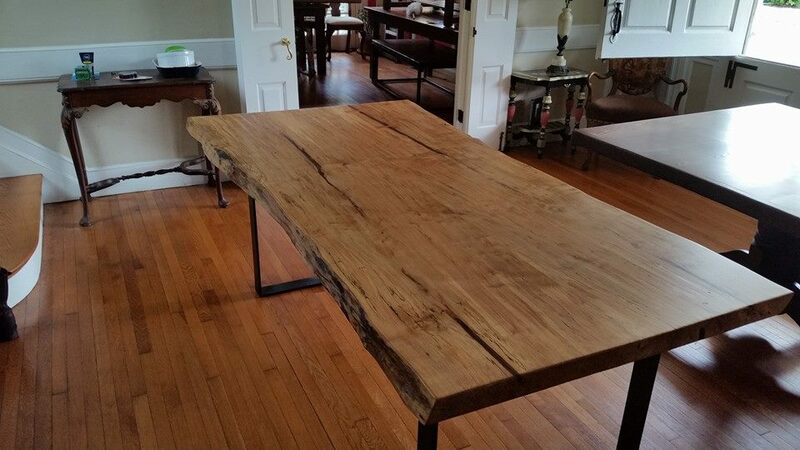 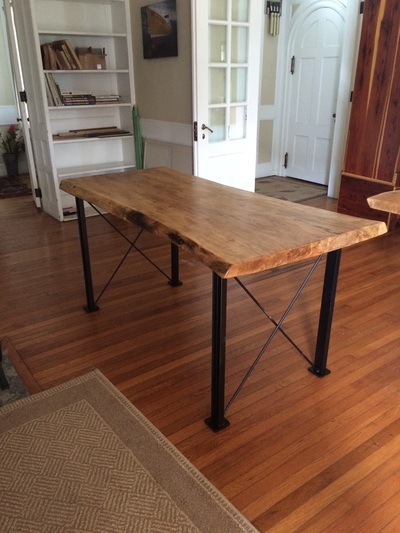 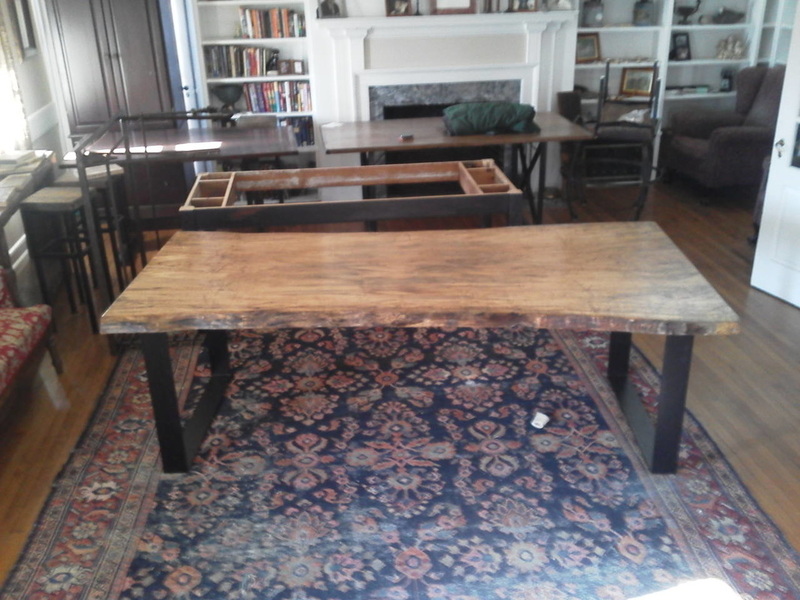 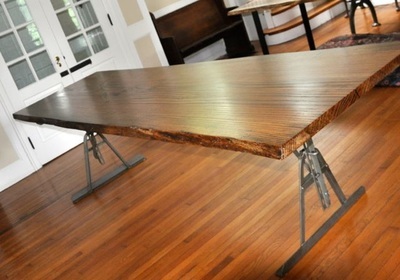 Live edge oak with distressed finish, repurposed scaffolding base. 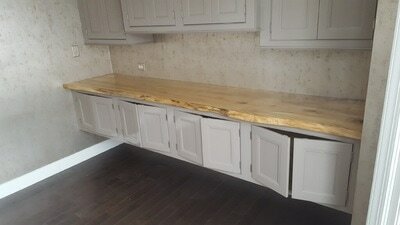 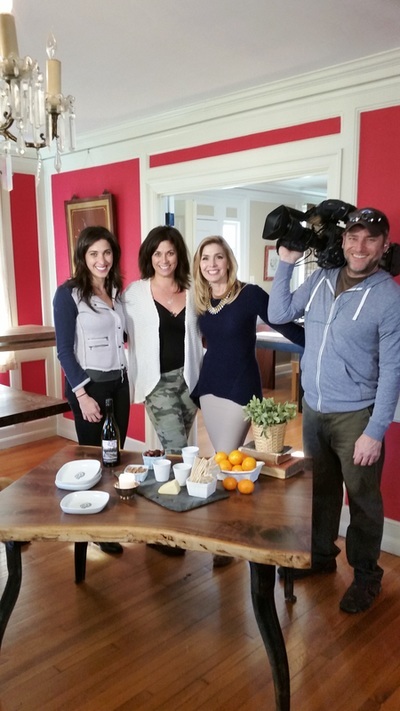 In the background a solid sycamore slab counter top. 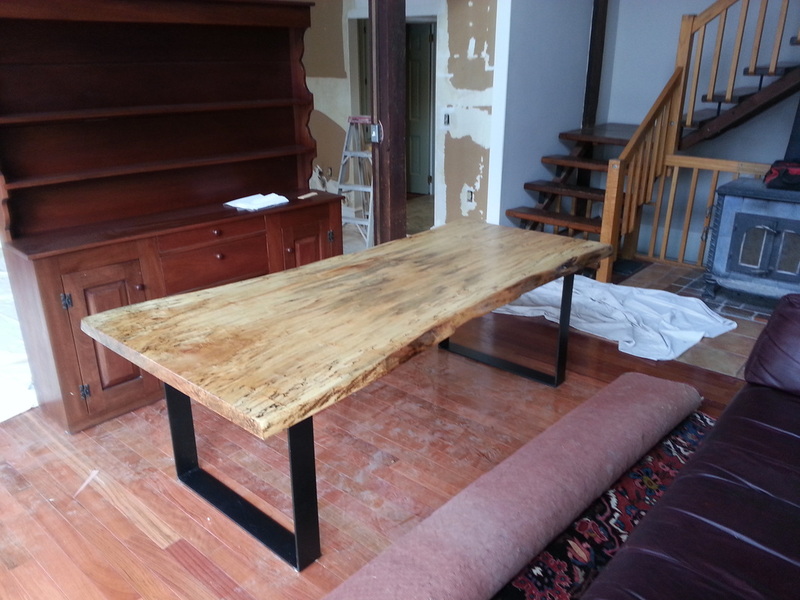 Live edge silver maple with repurposed mulch grinder base. 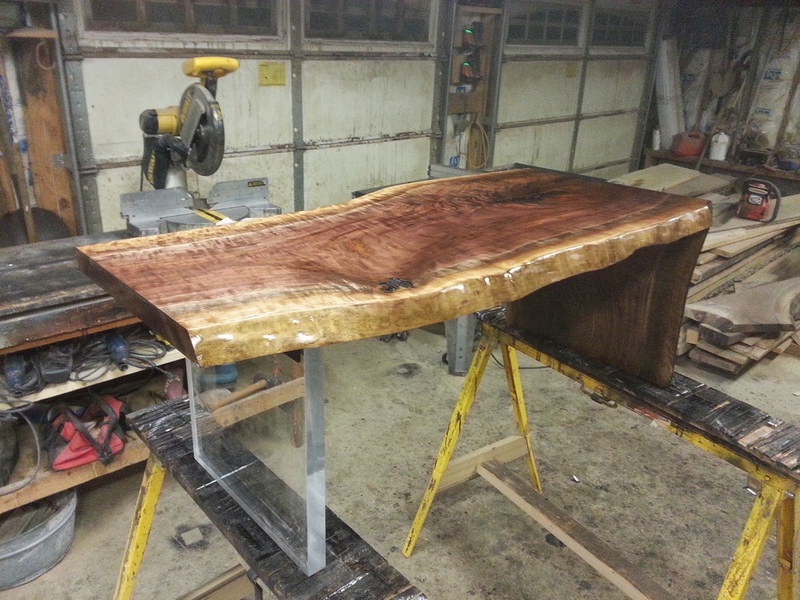 Live edge silver maple with chrome base. 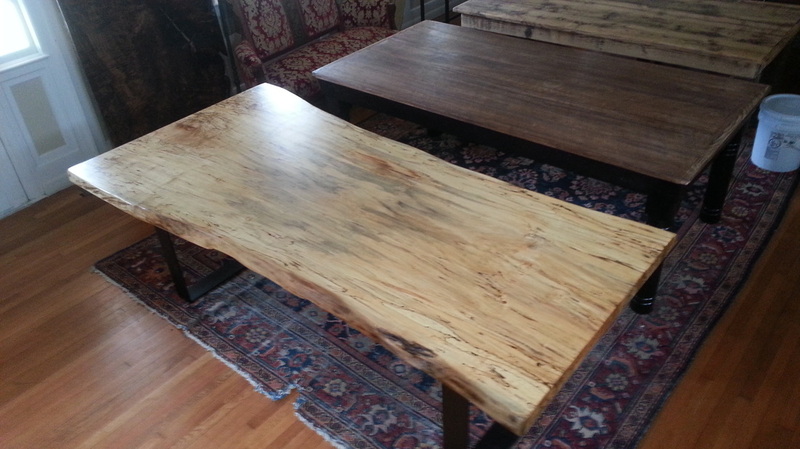 Live edge spalted maple with repurposed iron base. 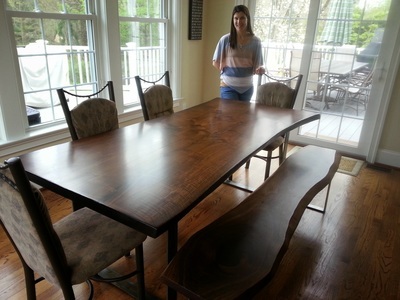 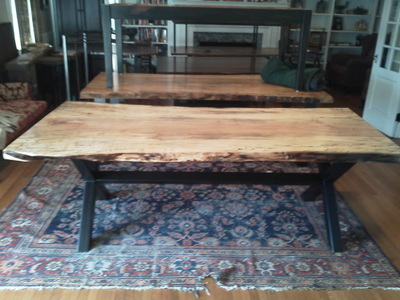 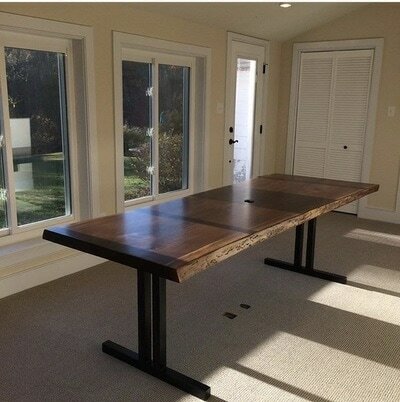 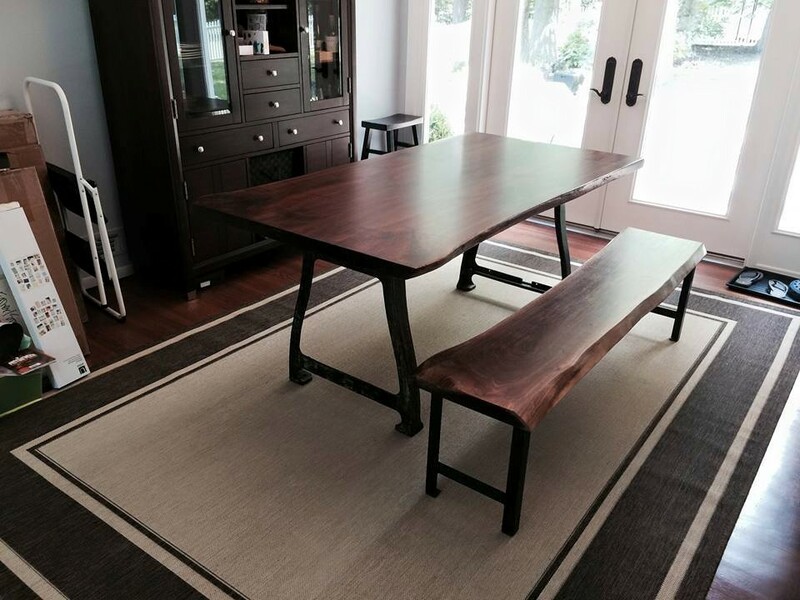 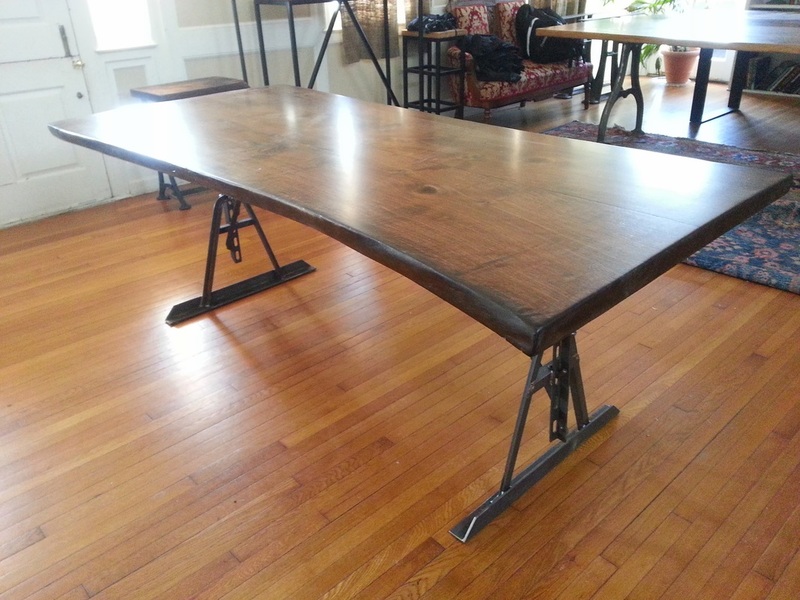 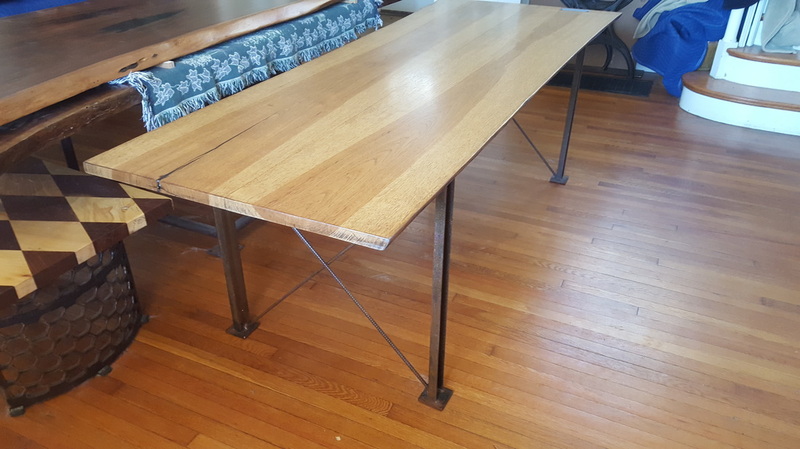 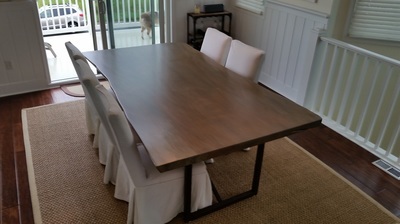 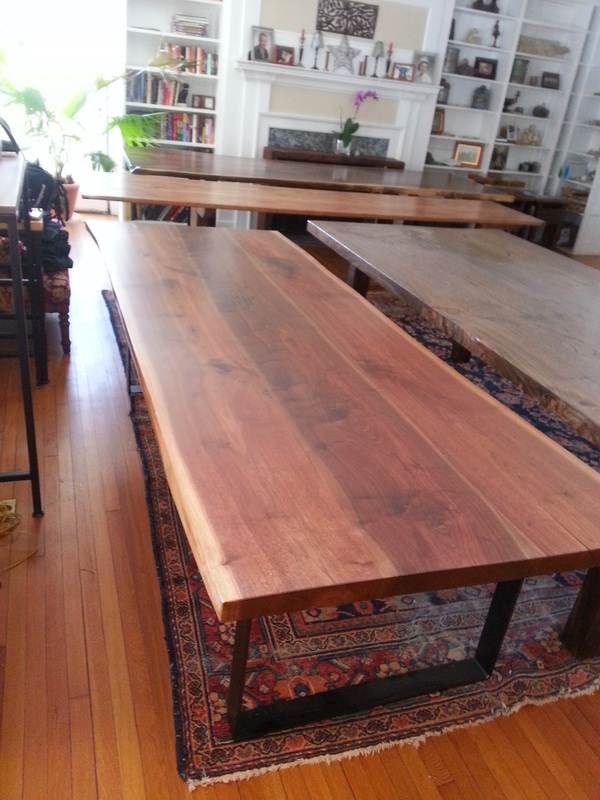 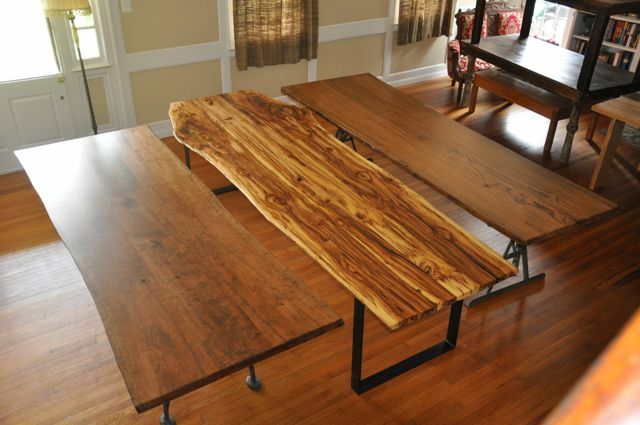 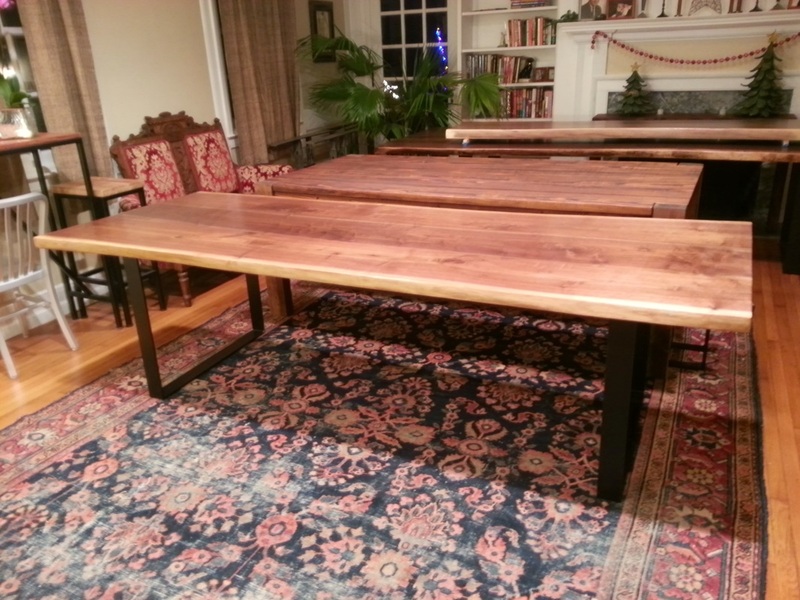 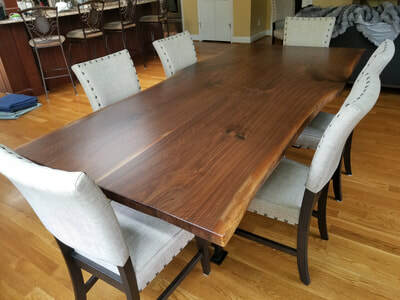 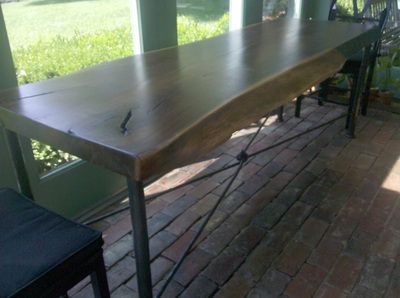 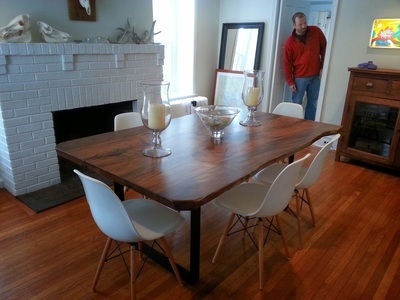 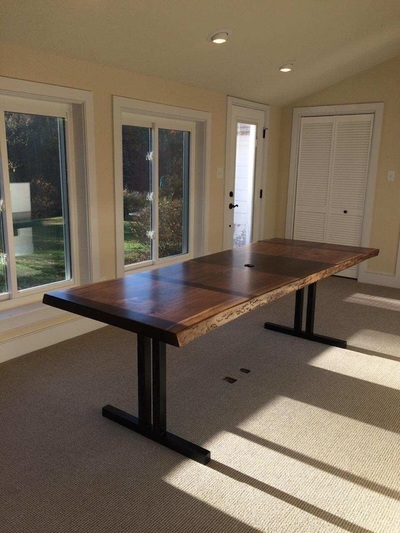 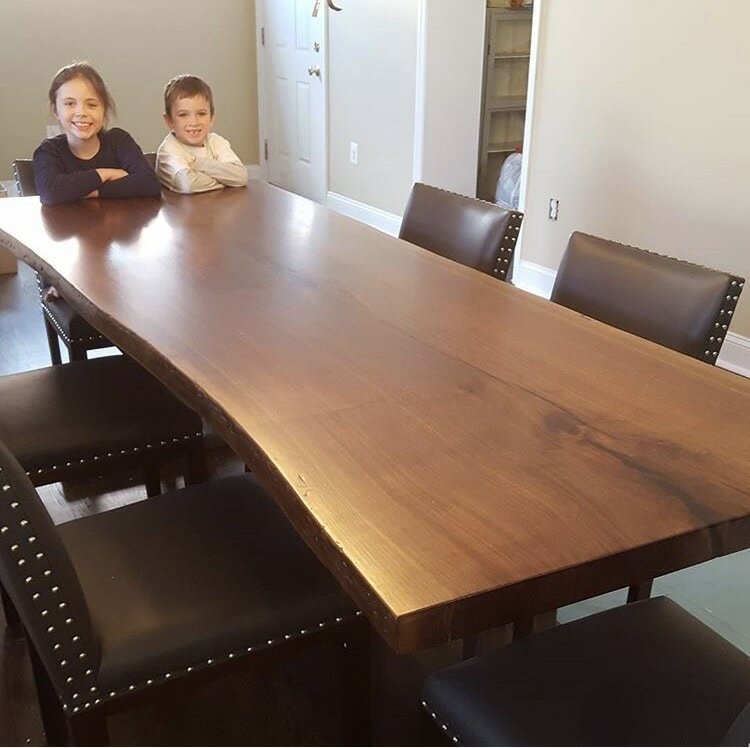 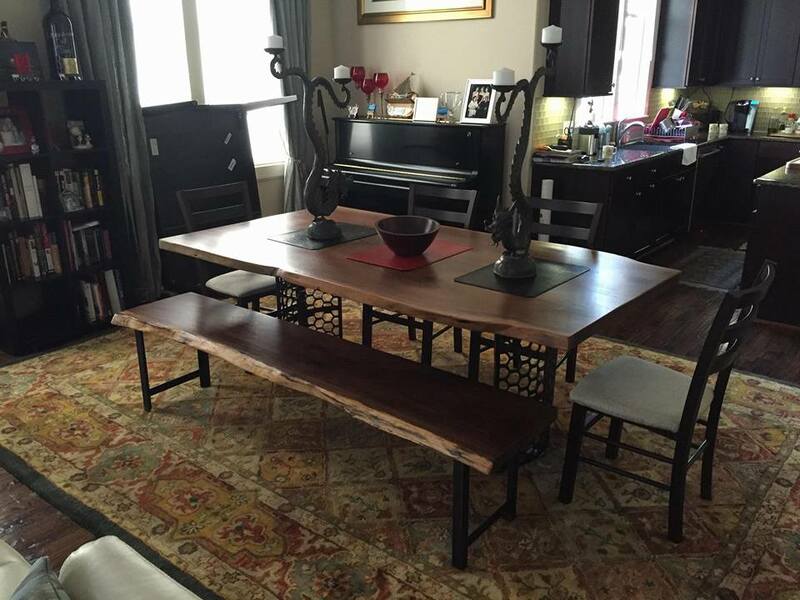 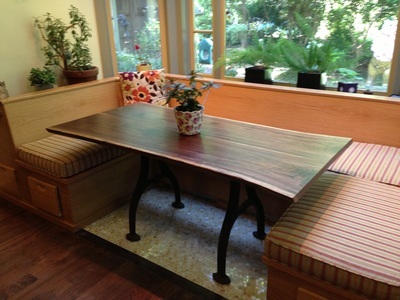 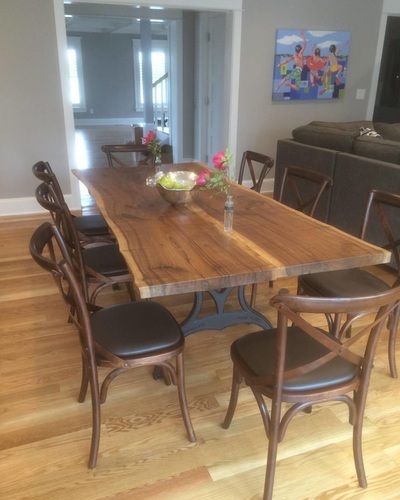 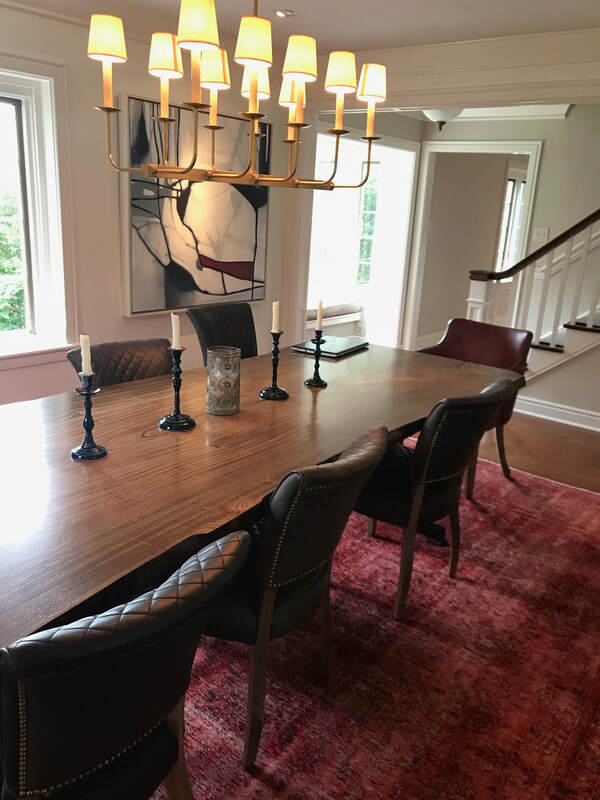 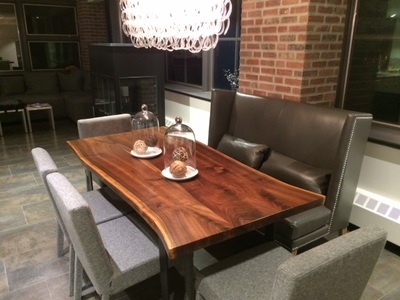 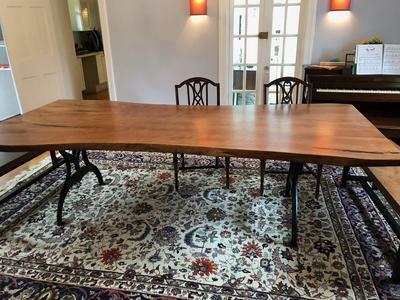 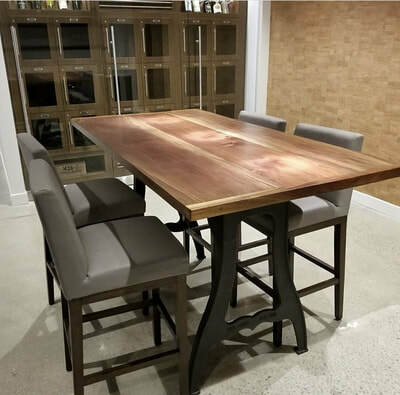 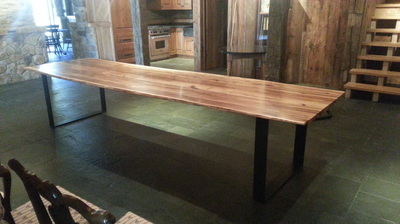 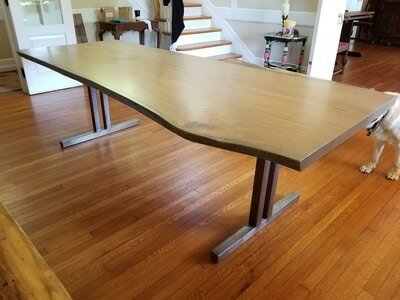 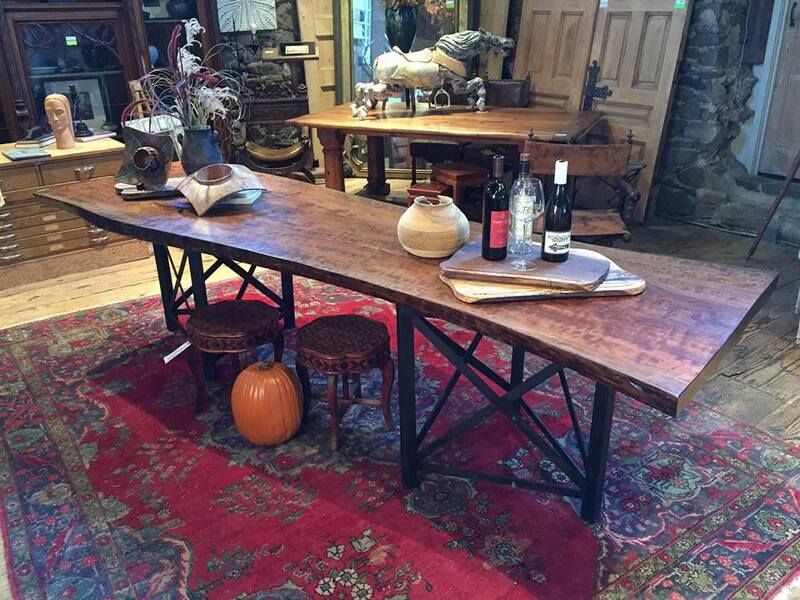 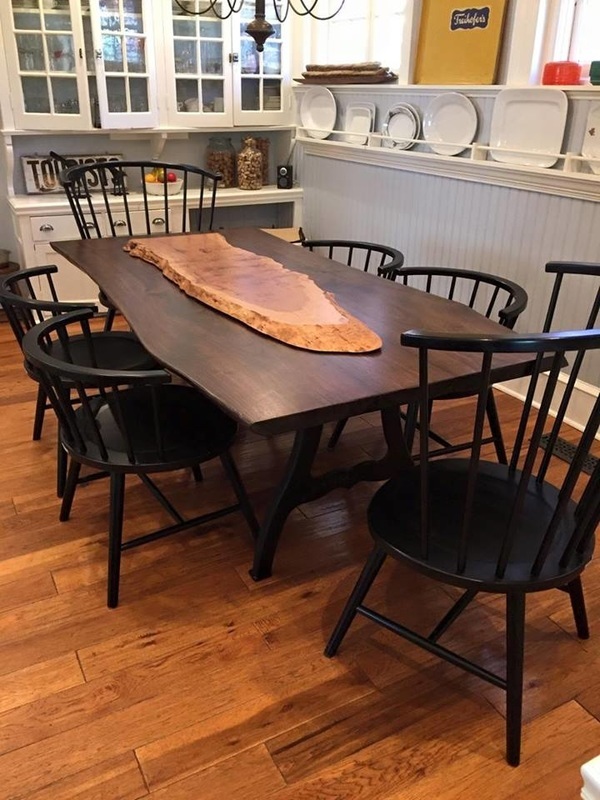 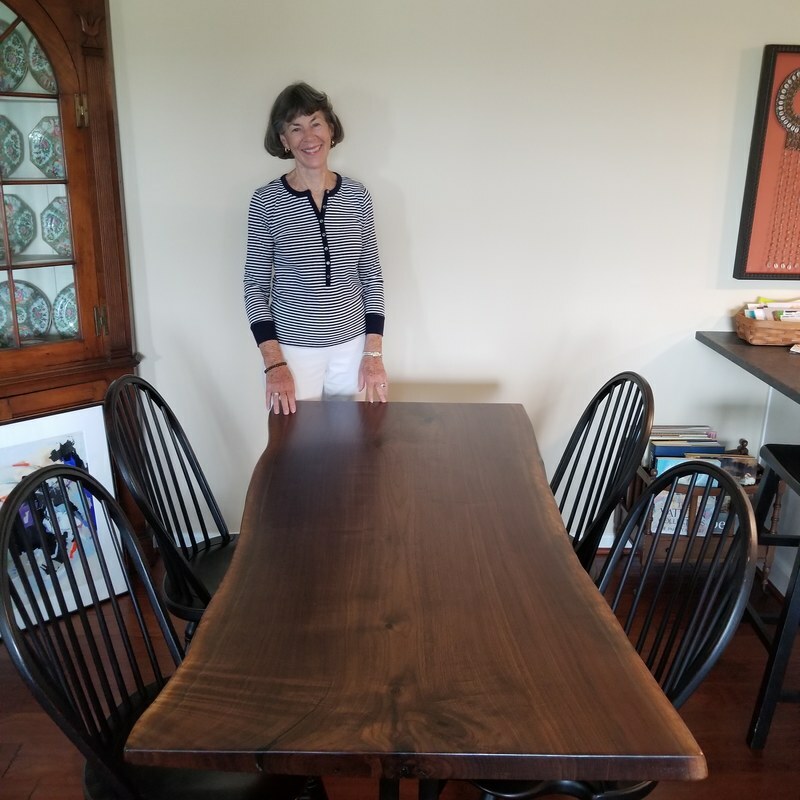 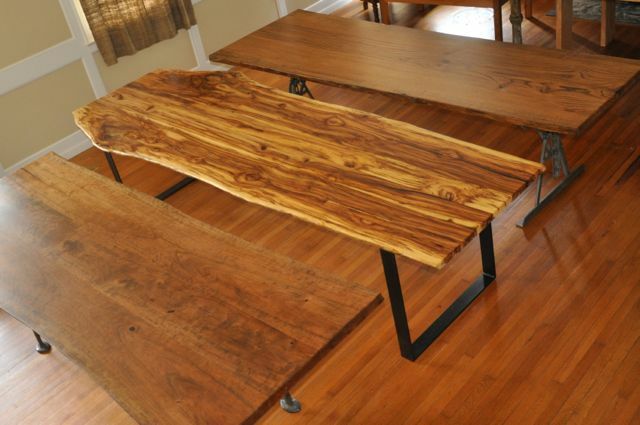 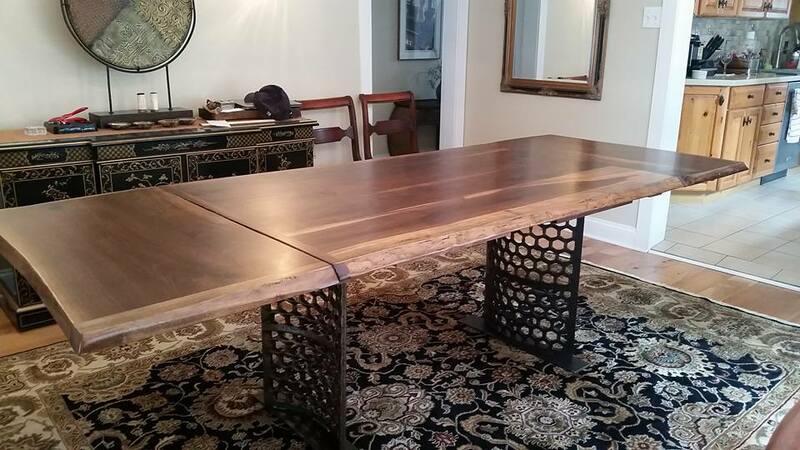 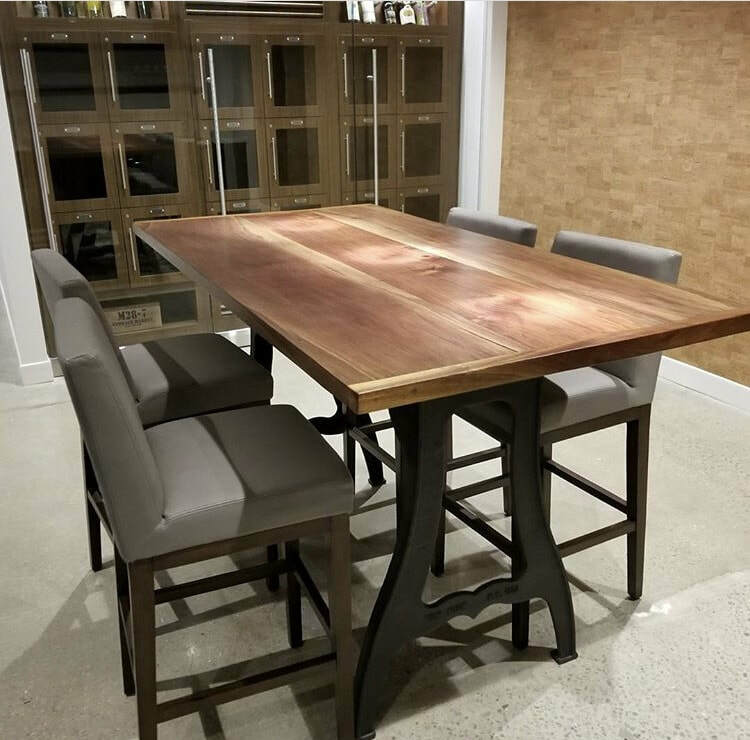 Live edge walnut dining table with bench and iron bases. 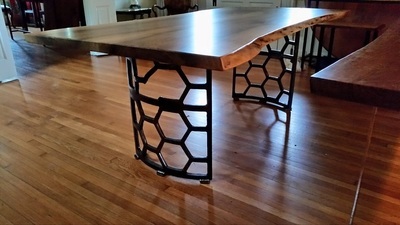 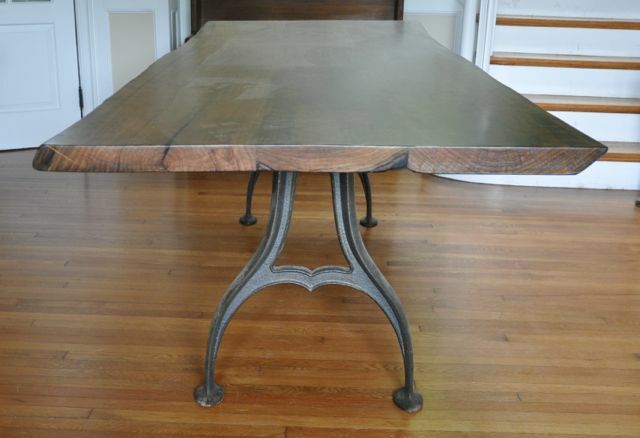 Table base was originally made for a gluing machine from a textile mill. Live edge walnut table and bench. 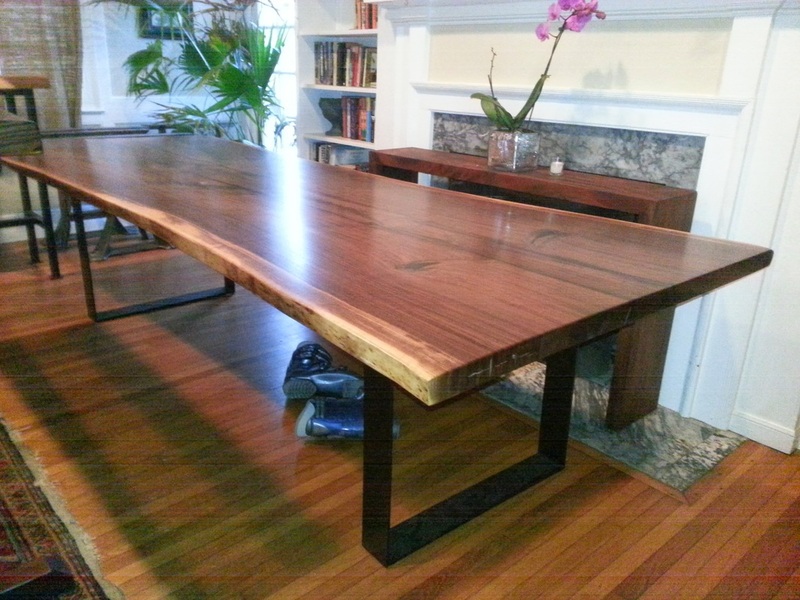 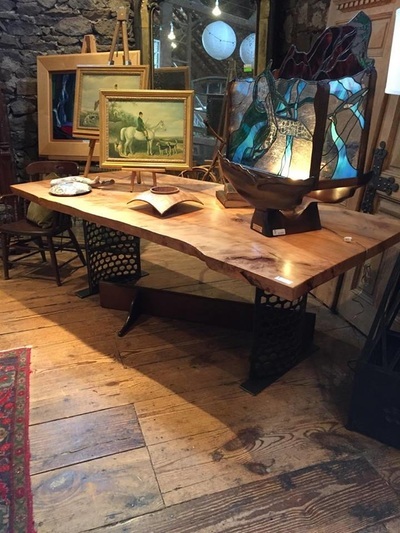 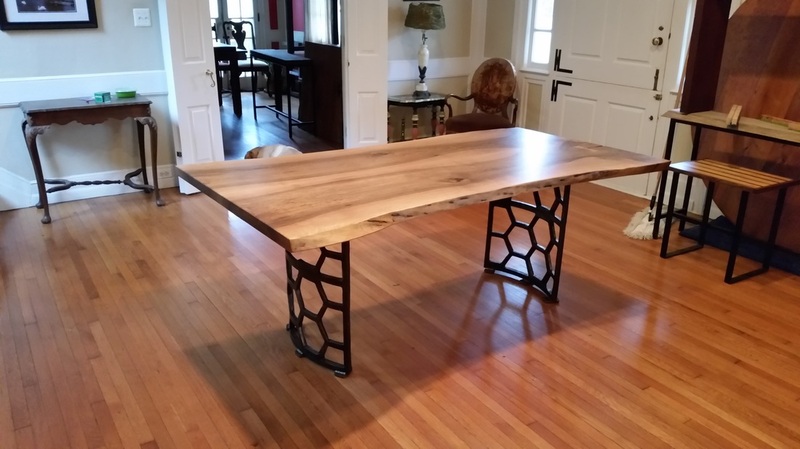 Live edge walnut table with two leaves and reclaimed iron base. Live edge walnut with cast iron "Brooklyn" base. 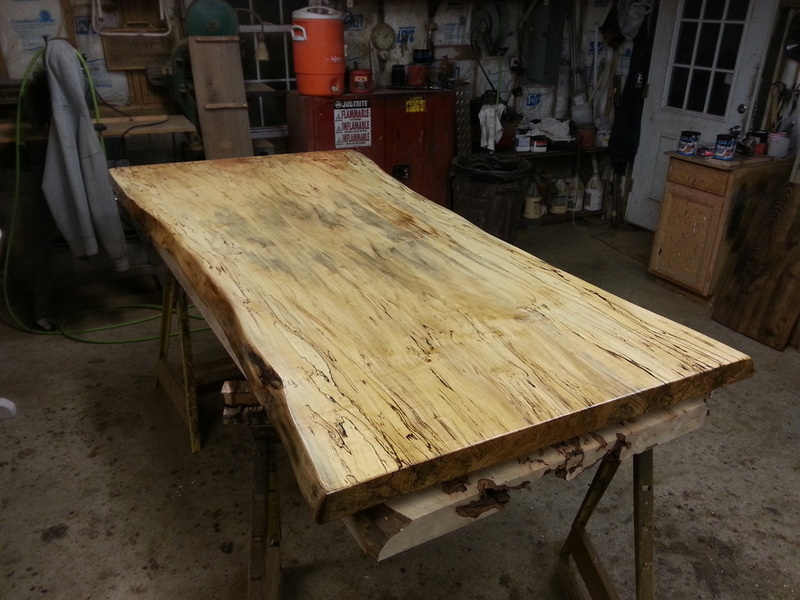 Spalted silver maple with match book top and contemporary iron base. 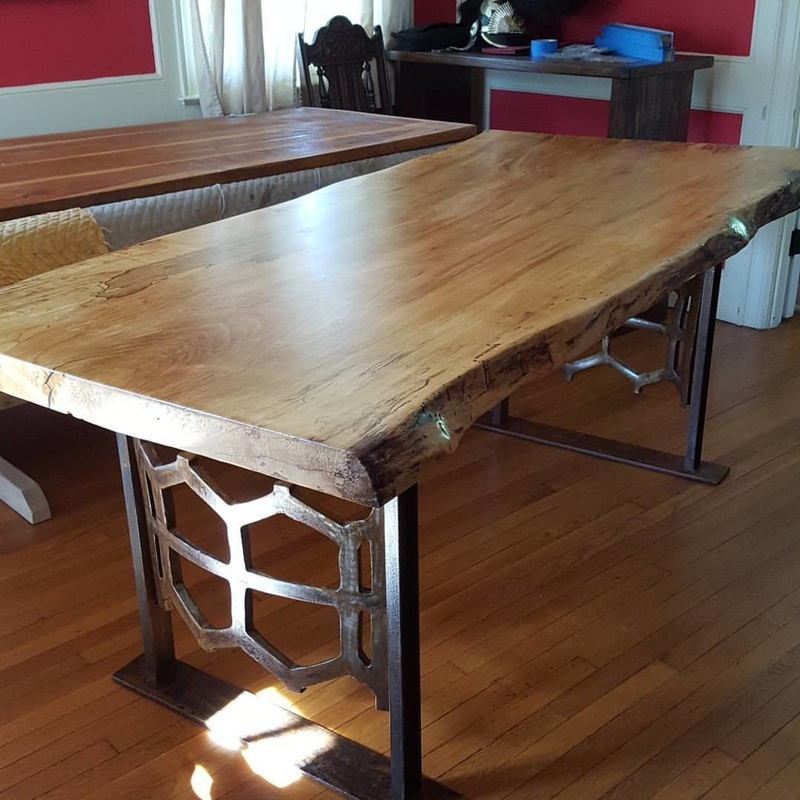 Walnut with repurposed cast iron base.